本发明涉及有效量的至少一种益生微生物和/或其部分和/或其代谢物用于预防和/或治疗头皮皮屑病症的应用，以及用于预防和/或治疗皮屑问题的美容方法，所述方法包括外用第一美容活性剂和至少第二美容活性剂，其中，所述第一美容活性剂和第二美容活性剂被配制成单独的组合物，所述第一美容活性剂选自益生微生物及其混合物，所述第二美容活性剂选自抗皮屑活性剂。 The present invention relates to an effective amount of at least one probiotic microorganism and / or a part thereof and / or a metabolite thereof for the prevention and / or treatment of dandruff conditions of the scalp, and for the prevention and / or cosmetic method for treating dandruff the method includes a first topical cosmetic active agent and at least a second cosmetic active agent, wherein said first cosmetic active agent and a second cosmetic active agent is formulated as separate compositions, the first cosmetic active agent is selected from from probiotic microorganisms, and mixtures thereof, the second cosmetic active agent chosen from antidandruff active agents. 本发明的主要目的是提供用于预防和/或治疗头皮病症，尤其是美学障碍(aesthetic disorder)的新型活性剂。  The main object of the present invention is to provide for the prevention and / or treatment of scalp disorders, especially aesthetic novel active agents barriers (aesthetic disorder) is. 具体而言，本发明涉及头皮皮肩病症，尤其是油脂性头皮。 In particular, the present invention relates to a head shoulder Phi conditions, especially oily scalp. 本发明还涉及提供用于预防和/或治疗头皮的皮肩问题(dandruff condition)的新型美容方法。 The present invention also relates to novel cosmetic method provides for the prevention and / or shoulder skin problems (dandruff condition) treatment of the scalp. 本发明还涉及适合用于本发明方法的组件或试剂盒。 The present invention further relates to a method of the present invention is suitable for use in a kit or component. 本发明还涉及旨在用于头皮护理的外用产品、食品增补剂或功能食品的领域。 The present invention further relates to the field intended for scalp care topical products, food supplements or functional foods. 与其它皮肤组织相同，头皮是经历连续再生的表皮，并且富含皮脂腺。  As with other skin, scalp skin is subjected to continuous regeneration, and is rich in sebaceous glands. 通常，头皮通过表皮皮肤细胞的不易察觉地、不可见的清除获得再生。 Typically, the scalp by imperceptible epidermal skin cells, invisible to obtain clear reproduced. 然而，头皮角质层细胞出于多种原因的过度再生可能导致形成大且厚的细胞碎片，该细胞碎片肉眼可见，被称为“皮肩(dandruff) 。 However, excessive regeneration of stratum corneum cells for a variety of reasons may cause the formation of large cell debris and thick, the visible cell debris, called "leather shoulder (dandruff). 多种因素都可促进皮肩的产生。  variety of factors can contribute to produce leather shoulder. 例如，可以提及的所述因素有压力、冬季、过量皮月旨、水合缺陷或马拉色菌(Malassezia spp. )类型的酵母在皮肤或毛囊的群集。 For example, the factors may be mentioned a pressure, winter months purpose excess skin, hydration defect or Malassezia (Malassezia spp.) Type of skin or hair follicles yeast cluster. 这些因素尤其具有引起或促进皮肤发炎的共同特点。 In particular, these factors have common characteristics cause or contribute to skin inflammation. 这种炎症促进了皮肩的出现或者甚至增加了出现的皮肩。 This inflammation promotes the emergence of leather shoulder shoulder or even increase the skin's appearance. 马拉色菌属由通常存在于人皮肤和某些温血动物皮肤上的亲脂酵母组成。  Malassezia normally present in the human skin and the skin of certain warm-blooded animal is a lipophilic yeast composition. 其分布取决于年龄、皮脂腺活性和某些病理。 Distribution depends on the age, pathology and certain sebaceous gland activity. 马拉色菌属酵母占无皮肩的个体头皮表面常见共生菌群的约45%，但在皮肩个体中可占共生菌群的75%，在相关的脂溢性皮炎的个体中达85%。 Malassezia yeast comprises about 45% of individuals without the shoulder surface of the scalp skin common commensal flora, but in an individual may comprise leather shoulder commensal flora 75%, up to 85 individual associated seborrheic dermatitis %. 存在于头皮表面的其它微生物为微球菌和丙酸菌。 Other microorganisms present in the surface of the scalp of Micrococcus bacteria and propionic acid. 头皮生态菌群失衡是促进或者甚至是增强皮肩存在的因素。 Scalp ecological flora imbalance is to promote or even the existence of factors that enhance skin shoulder. 皮肩问题是慢性、常见且易复发的问题，由于其不引人注意的性质而不受社会重视。  leather shoulder problem is chronic, common and easy to relapse of the problem, due to the nature of its inconspicuous without social importance. 许多因素都可扩大这些现象并导致其它病症的产生，例如头皮炎症。 Many factors can lead to the expansion of these phenomena and other conditions, such as inflammation of the scalp. 头皮的这些皮肩问题和/或炎症反映了表皮的屏障功能受损。 These leather shoulder problems and / or inflammation reflects the scalp skin barrier function is impaired. 此外，这些问题可产生瘙痒或痒的感觉，引起抓搔行为，而抓搔行为扩大了出现皮肩的现象。 In addition, these problems can be the feeling of itching or itchy, causing scratching behavior, and the behavior of scratching phenomenon expanded leather shoulder. 头皮的皮肩问题可以是油脂型或油型或干燥型的。 Leather shoulder Problems  scalp may be oil-based or oil-type or dry type. 干型头皮的皮肩问题通常更明显，且在皮肤水合病症过程中扩大，尤其是在头皮表皮的基本干燥过程中扩大。  Shoulder problems dry scalp skin are generally more significant, and expand during skin hydration disorders, especially expand substantially in the drying process of the scalp skin. 因此，干燥皮肩问题的治疗及其不雅表现的解决包括能够充分再水合头皮。 Thus, the drying leather shoulder problem and indecent treatment performance solution include the ability to fully rehydrate the scalp. 此外，如以上所述，头皮富含皮脂腺。  Further, as described above, the scalp is rich in sebaceous glands. 已经发现，当存在过量皮脂时更易形成皮肩， 且更容易瘙痒。 It has been found, when excess sebum more likely to form shoulder skin, itching and easier. 皮脂分泌是正常现象，其对皮肤和浓密的头发有用。 Sebum secretion is a normal phenomenon, which is useful for skin and thick hair. 皮脂保护头皮并通过润滑角皮使头发具有光泽。 Protect the scalp and the hair sebum by lubricating the cuticle glossy. 然而，过度分泌皮脂或皮脂溢可导致断裂、麻烦、不适感或不适的情绪、美学障碍或者甚至是皮肤病理。 However, excessive secretion of sebum or seborrhea can cause breakage, trouble, discomfort or discomfort emotional, aesthetic disorders or even skin pathology. 因此，皮脂的过量分泌促进油脂性或油性头皮的皮肩问题或者油脂性或者油性皮肩的出现。 Thus, excessive secretion of sebum promotes the shoulder skin problems arise or greasy or oily skin shoulder greasy or oily scalp. 最近还证明，马拉色菌型酵母具有高酯酶活性，引起皮脂甘油三酯水解，从而产生脂肪酸。  recently demonstrated that yeast of Malassezia type have high esterase activity causing hydrolysis of sebum triglycerides, to produce fatty acids. 这些脂肪酸在过敏型个体(即，具有受损的屏障功能并因此尤其更易受脂肪酸对皮肤屏障的破坏作用的影响的个体)中能够引起皮肩问题。 These allergic-type fatty acids in an individual (in particular, and therefore more susceptible to the damaging effects of fatty acids on the skin barrier, i.e., individuals having impaired barrier function) capable of causing skin problems shoulder. 因此，存在的皮脂越多，越易形成油性皮肩。  Thus, the presence of more sebum, oily skin shoulder formed more easily. 此外，存在的皮脂还具有更易瘙痒的趋势。 Furthermore, there is also a tendency to more sebum itching. 针对皮肩问题通常具有多种局部或全身治疗。  typically have a variety of local or systemic therapy for leather shoulder problems. 例如，通常建议将多种包含抗微生物剂或去角质剂或角质化调节剂的制剂用于治疗皮肩问题。 For example, various formulations contain generally recommended that antimicrobial agents or exfoliating agents or keratinization regulators shoulder for treating skin problems. 具体而言，已经提议将结合抗真菌剂和抗脂溢剂的制剂用于治疗严重的皮肩问题，尤其是在油脂性或油性皮肩问题的情况下。 Specifically, formulations have been proposed in conjunction with antifungal and anti-seborrhoeic agents for the treatment of severe skin problems shoulder, especially in the case of greasy or oily skin problems shoulder. 基于抗真菌的治疗被证明对油性皮肩问题具有一定的作用。 Anti-fungal treatment been shown to have some effect on oily skin problem on the shoulder. 然而，这些治疗的功效仅是暂时的，且需要使用者一方的严格坚持(经常使用且涂敷足够的时间）。  However, the efficacy of these treatments are only temporary, and the need to strictly adhere to one user (often used and applied enough time). 目前，这些治疗剂的长期每日使用可导致依赖现象，其引起其功效降低。 Currently, these long-term daily use of therapeutic agents can lead to dependence phenomenon, which is caused by its reduced efficacy. 这种依赖性可能与治疗终止时出现的反弹现象有关。 Rebound phenomenon that occurs when this dependence may be related to the termination of treatment. 通常这种反弹现象由于高皮脂溢或瘙痒而很明显，其通过破坏头皮的屏障功能而自相矛盾地易于加重皮肩问题。 Usually this rebound phenomenon due to high seborrhea or itching Obviously, that by disrupting the barrier function of the scalp and shoulder paradoxically easy to aggravate skin problems. 此外，某些抗皮肩活性剂对表皮细胞或头皮生态菌群的攻击性也可能影响头皮屏障功能，并导致皮肩问题的加重。  In addition, certain anti-skin agents may also affect the shoulder barrier function of the scalp epidermal cells or the scalp ecoflora aggressive, resulting in increased skin and shoulder problems. 在这些治疗剂的使用过程中，不利的副作用，如发热或刺激现象也可能很明显。  During use of these therapeutic agents, adverse side effects, such as fever or irritation may also be apparent. 这些副作用也可能反映出治疗的坚持性差，由此降低了其功效。 These side effects may also reflect poor treatment adherence, thereby reducing its effectiveness. 此外，通常用于治疗皮肩的多数活性剂通常具有讨厌的气味，这也降低了治疗的坚持性。  In addition, most commonly used to treat skin active agent typically has a shoulder unpleasant smell, which also reduces the adherence of treatment. 最后，抗皮肩治疗剂的功效通常显现的慢，并且需要长期严格涂敷。  Finally, anti-leather shoulder efficacy of therapeutic agents generally appear slow and requires long-term strictly applied. 这种时间延迟常常导致难以遵循该治疗。 This time delay often leads to difficult to follow the treatment. 因此，这些治疗剂的使用中出现很多失败，并且这些失败常常归因于以下因素:没有正确地遵循方法;没有坚持使用的频率;产品的不具美感的外表;洗涤碱的刺激;没有正确地坚持涂敷的时间;倦怠。  Thus, the use of these therapeutic agents in many failures occurred, and these failures are often due to the following factors: not properly follow the method; not adhere to the frequency of use; non-aesthetic appearance of the product; stimulation washing base; no rightly insists time applied; burnout. 因此，仍然需要能够对头皮问题产生有益的美容或治疗作用的新型活性剂。  Thus, there remains a need to be able to produce a beneficial cosmetic or therapeutic effect of the novel active agent to scalp problems. 还需要用于重建头皮生态菌群的活性剂，尤其是用于防止马拉色菌种在头皮上过度群集的活性剂。  needed for reconstruction of the scalp ecoflora active agents, especially agents for preventing bacteria Malassezia on the scalp over the cluster. 还需要可有效预防和/或治疗油性或干性头皮病症，且使用怡人且舒适由此提高对治疗的顺从性的新组合物。  need be effective in preventing and / or treating oily or dry scalp conditions, pleasant and comfortable to use and thereby improve the compliance of the new composition of the treatment. 还需要用于预防和/或治疗头皮瘙痒问题和脂溢性皮炎的新活性剂。  is also a need for the prevention and / or treatment of itching of the scalp and issues new agents seborrheic dermatitis. 还需要用于预防和/或治疗头皮炎症的新活性剂。  is also a need for the prevention and / or treatment of new active agents of inflammation of the scalp. 还需要用于使头皮与水化合的新活性剂和用于增强其屏障功能性质的新活性剂。  needed for hydrating the scalp new active agents and for enhancing its barrier function of the nature of the new active agent. 还需要用于预防、减轻和/或治疗头皮的皮肩问题，有效且没有可能不利地影响良好顺从性的副作用的新美容疗法。  needed for prevention, mitigation and / or treatment of scalp skin shoulder problems, effective, and there is no good could adversely affect the compliance of the side effects of the new beauty therapy. 还需用于头皮的皮肩问题的效果明显、快速且具有时间持续性的疗法。 Effect  The need for the shoulder of the scalp skin significant, rapid and sustained with time therapy. 还需要比现有疗法更高效的头皮的皮肩问题疗法。  The need for more efficient than existing therapies scalp skin problems shoulder therapy. 还需要不对头皮生态菌群产生不利影响，或者甚至可增强存在的健康生态菌群的头皮的皮肩问题疗法。  need not adversely affect the scalp ecological flora, or even leather shoulder problems can enhance the ecological health of the scalp therapy flora present. 还需要能够维持或者甚至增强头皮水合作用的皮肩问题疗法。  also need to be able to maintain or even enhance the leather shoulder problem scalp hydration therapy. 需要能够维持或者甚至增强头皮屏障性质的皮肩问题疗法。  need to be able to maintain or even enhance the barrier properties of the scalp skin therapy shoulder problem. 需要没有上述副作用，且尤其不诱导高皮脂溢、脂溢性皮炎或瘙痒问题的皮肩问题疗法。  needs no such side effects, and in particular does not induce high seborrhea, seborrheic dermatitis or itchy skin therapy shoulder problem issues. 还需要不诱导炎症的皮肩问题疗法。  does not need to issue a shoulder skin inflammation-inducing therapy. 最后，还需要有效且简单，并且能够以延长或重复方式实施而不加重皮肩问题的皮肩问题疗法。  Finally, there is a need for effective and simple, and can be extended or repeated embodiment embodiment transdermal therapy without aggravating problems shoulder leather shoulder problems. 本发明的目的是满足以上需求。  The object of the present invention is to meet these requirements. 因此，一方面，本发明涉及有效量的至少一种益生微生物（尤其是乳杆菌属(Lactobacillus sp.genus)和/或双歧杆菌属（Bifidobacterium sp.genus)的益生微生物）、其部分和/或其代谢物作为用于预防和/或治疗头皮病症(尤其是头皮的皮肩问题）的活性剂的美容应用。  Accordingly, in one aspect, the present invention relates to an effective amount of at least one probiotic microorganism (especially Lactobacillus (Lactobacillus sp.genus) and / or the genus Bifidobacterium (Bifidobacterium sp.genus) probiotic microorganisms), which portion and / or a metabolite thereof as for preventing and / or treating scalp disorders (especially the scalp skin problems shoulder) cosmetic application of active agents. 另一方面，本发明提供了用于治疗和/或预防个体头皮美学障碍的方法(尤其是美容方法），包括向所述个体施用至少有效量的至少一种益生微生物(尤其是乳杆菌属和/或双歧杆菌属的益生微生物)和/或其部分和/或其代谢物的至少一个步骤。  In another aspect, the present invention provides / or methods (especially cosmetic method), comprising administering to said individual at least an effective amount of at least one probiotic microorganism (especially milk preventing aesthetic disorders of the scalp of the subject for treating and / genus Bifidobacterium or probiotic microorganisms) and / or portions thereof / and at least one step and the genus Bacillus or a metabolite thereof. 本发明的方法尤其可有利地用于具有头皮皮肩问题的个体。  The method of the present invention is particularly advantageous for individuals having head Phi shoulder problems. 本发明的美容处理方法尤其可通过这些组合物的常规使用技术施用本发明的美容用和/或皮肤病用组合物(dermatological composition)或组合而得到实现。 Cosmetic treatment method  In particular, the present invention can be administered with the present invention, cosmetic and / or dermatological by conventional techniques using these compositions composition (dermatological composition) or in combination achieved. 例如，向角质(例如皮肤或干发)涂敷霜、凝胶、精华素、洗剂(lotion)、卸妆乳或晒后用组合物，向湿发涂敷头发洗剂(hair lotion)或香波，作为外用。 For example, to keratinocytes (e.g., skin, hair or dry) applied cream, gel, cream, lotion (Lotion), cleansing milk or after-sun composition, hair lotion is applied to wet hair (hair lotion) or shampoos as for external use. 因此，本发明的美容方法可通过外用（例如每日外用）本发明的组合物而得到实现。  Thus, the cosmetic method of the present invention can be achieved by topical (e.g. daily topical) composition of the present invention. 本发明的方法可以包括单次施用。  The method of the present invention may comprise a single administration. 根据另一个实施方式，所述施用是重复的，例如每日2-3次重复一天或多天，或者通常重复至少4周的持续时间，或者甚至4-15周，如果合适，可有一个或多个中断期。 According to another embodiment, the administration is repeated, for example 2-3 times daily repeated one or more days, or duration generally repeated at least 4 weeks, 4-15 weeks, or even, if appropriate, may have one or multiple interrupt period. 因此，另一方面，本发明涉及用于预防和/或治疗头皮的皮肩问题的美容方法，所述方法包括在第一和第二连续时间施用有效量的至少第一美容活性剂，其中所述时间共同形成次序;和，在选自第一时间和第二时间的单个时间内外用至少第二美容活性剂，其中， 所述第一美容活性剂和第二美容活性剂被配制成单独的组合物，所述第一美容活性剂选自益生微生物、其部分和/或其代谢物及其混合物，所述第二美容活性剂选自抗皮肩活性剂。  Accordingly, another aspect, the present invention relates to the prevention and / or cosmetic, the method of treating skin problems shoulder scalp comprising administering an effective amount of a first and second continuous period of at least a first cosmetic active agent , together form a sequence wherein the time; and, at a single time and outside selected from the first time and the second time with at least a second cosmetic active agent, wherein said first cosmetic active agent and a second cosmetic active agent is formulated into separate compositions, the first cosmetic active agent being chosen from probiotic microorganisms, a fraction thereof and / or metabolites thereof, and mixtures thereof, the second cosmetic active agent selected from anti-skin agent shoulder. 意外地，本发明人观察到益生微生物，尤其是乳杆菌属和/或双歧杆菌属的益生微生物，使通过作用于水合作用和头皮屏障功能减少皮肩问题成为可能。  Surprisingly, the present inventors have observed that a probiotic microorganism, especially of the Lactobacillus and / or Bifidobacterium probiotic microorganism, so that by acting on the hydration of the scalp and skin barrier function to reduce possible problems shoulder. 此类微生物的使用促进了肠粘膜水平对饮食所提供的养分的吸收的优化，并有利于促进对细胞代谢和皮肤的各种功能和结构成分的合成至关重要的养分的供应。  The use of such microorganisms to promote the optimization of the nutrition diet provided by the intestinal absorption levels, and help to promote the supply of nutrients essential to the synthesis of a variety of functional and structural components of cell metabolism and skin. 因此，皮肤屏障功能的增强使降低皮肤炎症，保持屏障平衡及屏障完整性，以及保持生态菌群平衡成为可能。  Thus, enhancing skin barrier function of the skin so that reduce inflammation, to maintain balance of barrier and barrier integrity, as well as possible to maintain a balanced ecoflora. 由此使头皮刺激和瘙痒较小，脆性较低而水合较高，并且皮肩问题得到降低。  whereby the scalp irritation and itching smaller, lower brittleness and higher hydration, skin and shoulder problems are reduced. 此外，意外地，本发明人还观察到在一段时间施用尤其是口服施用益生微生物(尤其是乳杆菌属，特别是副干酪乳杆菌(Lactobacillus paracasei))和外部施用抗皮肩活性剂尤其是吡啶硫酮锌，所述口服施用益生微生物(尤其是乳杆菌属，特别是副干酪乳杆菌(Lactobacillus paracasei))和外部施用抗皮肩活性剂尤其是P比啶硫酮锌在没有抗皮肩活性剂下使用所述益生微生物的另一段时间之前或之后，尤其是在之后进行，这可能有效降低头皮的皮肩问题且没有明显副作用，例如瘙痒问题、脂溢性皮炎或炎症。  In addition, surprisingly, the present invention is further observed that the administration over a period of time, especially for oral administration of probiotic microorganisms (especially Lactobacillus, in particular Lactobacillus paracasei (Lactobacillus paracasei)) and external administration antimesothelin shoulder agent especially zinc pyrithione, the oral administration of probiotic microorganisms (especially Lactobacillus, in particular Lactobacillus paracasei (Lactobacillus paracasei)) and external administration antimesothelin shoulder agent in particular P of pyridine thione zinc in the absence of anti- another period of time prior to use of the probiotic microorganisms in the skin or the active agent after the shoulder, especially after performed, which may reduce the shoulder of the scalp and skin without significant side effects such as itching problems, seborrhoeic dermatitis or inflammation. 与单独使用这些美容活性剂相比，这种治疗的效果明显更快、更强。  Compared with the use of these cosmetic active agent alone, the effect of the treatment is significantly faster, stronger. 此外，在一段时间施用尤其是口服施用益生微生物和外部施用作为抗皮肩活性剂的另一益生微生物，所述施用尤其是口服施用益生微生物和外部施用作为抗皮肩活性剂的另一益生微生物在没有抗皮肩活性剂下使用所述第一益生微生物的另一段时间之前或之后进行，这可能加快抗皮肩治疗的有益效果的形成和提高甚至扩大该作用的强度。  Further, in a period of time of administration, especially oral administration of probiotic microorganism and an outer administered as an anti-leather shoulder agent other probiotic microorganism, the administration of another, especially for oral administration of probiotic microorganism and an outer administered as an anti-leather shoulder active agent a probiotic microorganism used for another period of time before the first or after the probiotic microorganism in the absence of an anti-skin agent under the shoulder, which may accelerate the formation of a beneficial effect and anti-skin treatment shoulder improve the strength of the effect is even enlarged. 本发明人尤其观察到，在本发明的治疗后，存在的皮肩大幅减少，或者甚至不存在，并且皮肩屏障性质也得到加强。  The present invention is particularly observed in the treatment of the invention, the presence of leather shoulder substantially reduced or even non-existent, and the shoulder skin barrier properties has also been strengthened. 因此，令人惊奇地，口服施用促进对肠粘膜的细胞代谢至关重要的养分的吸收的益生微生物(尤其是乳酸益生微生物），能够间接抑制外用抗皮肩活性剂的有害作用，并能够增强外用抗皮肩活性剂的功效，或者甚至产生预防、减少和/或治疗皮肩的协同作用。  Thus, surprisingly, the oral administration of nutrients to promote the absorption of intestinal metabolism of the cells of vital probiotic microorganisms (in particular lactic acid probiotic microorganisms) can indirectly inhibit the deleterious effects of external shoulder antimesothelin active agent, and capable of enhancing the efficacy of topical anti-skin agent of the shoulder, or even produce prevention, reduction and / or synergistic effect of the therapeutic skin shoulder. 本发明方法的这种令人惊奇的作用是因为本发明人首次使用了两个治疗步骤获得的，所述两个治疗步骤即为包括在一段时间施用益生微生物和抗皮肩活性剂(该活性剂通过外部施用）的第一步骤，和之后或之前进行的（尤其是之后进行的）包括在没有抗皮肩活性剂存在下施用益生微生物另一段时间的第二步骤。  This surprising effect of the method of the present invention because the present invention uses the first two steps to get the treatment, namely the two step treatment comprising administering probiotic microorganism and an active agent shoulder antimesothelin a period of time a first step (the active agent by external application), and (especially after performed) comprises transdermal administration of an anti shoulder without the presence of an active agent and probiotic microorganisms before or after another step of a second period of time. 这种步骤次序使得可能有利地大幅减少或者甚至消除抗皮肩活性剂的副作用并同时增强所述益生微生物对头皮屏障性质的有益效果。  This sequence of steps makes it possible advantageously to substantially reduce or even eliminate the anti-skin agent shoulder side effects while enhancing the beneficial effects of probiotic microbial barrier properties of the scalp. 对头皮屏障性质的保护和增强能够减少皮肤炎症，维持屏障平衡、屏障完整性并保持生态菌群平衡。  The protection of the scalp and enhanced barrier properties of skin inflammation can be reduced, maintaining the balance of the barrier, barrier integrity and maintain the ecological balance of flora. 头皮刺激和瘙痒较小，脆性较低而水合较高，并且皮肩问题得到降低。  scalp irritation and itching smaller, lower brittleness and higher hydration, skin and shoulder problems are reduced. 这种步骤次序还使得可能加速抗皮肩治疗功效的显现和扩大其有益作用的强度。  This sequence of steps also makes it possible to accelerate the therapeutic efficacy of anti-appearing skin shoulder strength and expansion beneficial effect. 有利地，使用本发明的益生微生物(尤其是乳杆菌属和/或双歧杆菌属的益生微生物，并且尤其是副干酪乳杆菌STll菌株）、其部分和/或其代谢物使得可能恢复处于良好平衡的健康头皮并重建平衡的生态菌群。  Advantageously, the present invention probiotic microorganisms (especially of the Lactobacillus and / or Bifidobacterium probiotic microorganisms, and in particular Lactobacillus paracasei STll strain), a fraction thereof and / or metabolites thereof makes it possible to restore the health of the scalp in good balance and rebuild the ecological balance of flora. 本发明的组合物可有利地使得可能通过诱导表皮防御蛋白以重建平衡的生态菌群。  The compositions of the invention may advantageously be induced by making it possible to reconstruct the epidermal defense proteins establish a balanced ecoflora. 另一个优点是，本发明的应用可减少和/或治疗由马拉色菌代谢皮脂脂质产生的刺激性代谢物的存在引起的头皮瘙痒。  Another advantage is that the application of the present invention may reduce and / or treatment of itching of the scalp sebum lipid metabolites produced by the fungus Malassezia irritation caused by the presence of metabolites. 另一个优点是，本发明的方法或应用可促进头皮的水合和完整性的维持。  Another advantage is that the method or use of the present invention may promote hydration and maintaining the integrity of the scalp. 此外，有利地，本发明的方法使得可能减少抗皮肩活性剂的涂敷时间和产生副作用的风险并同时维持或者甚至加强其活性。  Moreover, advantageously, the method according to the present invention makes it possible to reduce the risk of anti-active agent coated leather shoulder and side effects and time while maintaining or even reinforcing their activity. 本发明的方法有利地使得可能加速抗皮肩治疗有益效果的出现和扩大其强度。  The method of the present invention advantageously makes it possible to accelerate the emergence of anti-leather shoulder therapy and expand the strength benefits. 本发明的方法还有利地使得可能恢复处于良好平衡的健康头皮并重建平衡的生态菌群。  The method of the present invention also advantageously makes it possible to recover in good balance and a healthy scalp ecoflora restore balance. 另一个优点是，本发明的方法使得可能减少和/或治疗使用刺激性抗皮肩活性剂后的头皮瘙痒。  Another advantage is that the method of the present invention makes it possible to reduce and / or treatment of itching of the scalp skin anti-irritant after use shoulder agent. 另一方面，本发明涉及有效量的至少一种益生微生物(尤其是乳杆菌属和/或双歧杆菌属的益生微生物），和/或其部分和/或其代谢物在制备用于预防和/或治疗头皮炎症的药用或皮肤病用组合物中的应用。  another aspect, the present invention relates to an effective amount of at least one probiotic microorganism (especially of the Lactobacillus and / or Bifidobacterium probiotic microorganism), and / or portions thereof and / or a metabolite thereof for the manufacture of and / or treating inflammation of the scalp with the use of a pharmaceutical or dermatological composition for the prevention. 具体而言，发现此种组合物对治疗头皮干燥问题或干燥病、头皮瘙痒或头皮脂溢性皮炎有效。  Specifically, it was found that such problem was dried composition for treating or xerosis of the scalp, scalp seborrheic dermatitis or scalp itching effective. 本发明的组合物可有利地用于预防和/或治疗马拉色菌引起的皮肤感染，尤其是头皮感染。  The compositions of the invention may advantageously be used for preventing infections of the skin and / or treatment of Malassezia caused, especially the scalp infection. 本发明的应用还可以包括至少有效量的至少第一益生微生物(尤其是乳杆菌属或双歧杆菌属的益生微生物)和/或其部分和/或其代谢物，以及有效量的不同于所述第一益生微生物的至少第二微生物(尤其是益生微生物)的应用。  Application of the present invention may further comprise at least an effective amount of at least a first probiotic microorganism (especially Lactobacillus or Bifidobacterium probiotic microorganisms) and / or portions thereof and / or a metabolite thereof, and an effective amount of a different from said first probiotic microorganism applying at least a second microorganism (especially probiotic microorganisms) a. 出于本发明的目的，“不同于所述第一益生微生物”的表述表示可以在所述组合物中区分两种不同的微生物或同一微生物的两种不同形式。  For purposes of the present invention, "different from said first probiotic microorganism" shall mean two different forms can be distinguished two different microorganism or microorganisms in the same composition. 因此，当第二微生物为，例如乳杆菌属或双歧杆菌属的益生微生物并对应于与本发明相同的菌种时，则所述第二微生物以不同于第一微生物的形式存在。 Thus, when the second microorganism is, for example, Lactobacillus or Bifidobacterium probiotic microorganism of the present invention and corresponds to the same species, then the second microorganism present in the form different from the first microorganism. 另一方面，本发明涉及用于预防和/或治疗头皮障碍(尤其是头皮的油性皮肩问题）的美容用和/或皮肤病用组合物，其包含生理学上可接受的载体、至少有效量的至少一种益生微生物(尤其是乳杆菌属和/或双歧杆菌属的益生微生物)和/或其部分和/或其代谢物，以及选自抗脂溢活性剂、水合活性剂和抗皮肩活性剂及其混合物的有效量的至少一种活性剂(尤其如下文所述）。  another aspect, the present invention relates to cosmetic and / or dermatological composition for preventing and / or treating scalp disorders (especially oily scalp skin problems shoulder), comprising a physiologically acceptable carrier, at least an effective amount of at least one probiotic microorganism (especially of the Lactobacillus and / or Bifidobacterium probiotic microorganisms) and / or portions thereof and / or a metabolite thereof, and an anti-seborrhoeic active agent selected, the active agent hydration and an effective amount of an anti-skin agent and the shoulder of the mixture of at least one active agent (particularly, as described below). 根据本发明的一个变化的实施方式，本发明的微生物可以口服使用。  According to one variant embodiment of the present invention, the microorganism of the present invention may be used orally. 根据本发明的一个变化的实施方式，本发明的微生物可以外部使用。  According to one variant embodiment of the present invention, the microorganism of the present invention may be used outside. 如下文所述，包含本发明微生物的组合物经配制从而与所选择的施用方法相容。  As described below, the microorganism of the present invention comprises a composition to be compatible with the chosen method of administration formulated. 本发明涉及美容组合物或皮肤病用组合物或药物组合物形式的本发明微生物的应用。  The present invention relates to the use cosmetic or dermatological compositions of the present invention is a microorganism or a composition in the form of a pharmaceutical composition thereof. 根据另一个实施方式，在本发明的方法中，口服或外用并且尤其是口服第一美容活性剂。  According to another embodiment, in the method of the present invention, oral or topical and especially oral first cosmetic active agent. 根据另一个实施方式，在本发明的方法中，优选在第一时间施用第二美容活性剂。  According to another embodiment, in the method of the present invention, the second cosmetic active agent is preferably administered in the first time. 根据另一个实施方式，本发明的方法可有利地适合预防和/或治疗与头皮干燥或干燥症、头皮高皮脂溢、生态菌群失衡、瘙痒、头皮炎症或头皮屏障功能失衡相关的头皮的皮肩问题。  According to another embodiment, the method of the present invention may be advantageously suitable for the prevention and / or treatment of xerosis or dry scalp, scalp seborrhea high ecological imbalance flora, itching, inflammation of the scalp or scalp barrier function related to unbalance leather shoulder problem scalp. 另一方面，本发明涉及包含至少第一美容组合物和第二美容组合物的美容组件， 其中，所述第一组合物包含至少有效量的至少第一美容活性剂，所述第一美容活性剂为副干酪乳杆菌、其部分和/或其代谢物，所述第二组合物包含至少有效量的选自抗皮肩活性剂且为外用的至少第二美容活性剂。  another aspect, the present invention relates to a cosmetic assembly comprising at least a first and a second cosmetic compositions of the cosmetic composition, wherein the first composition comprises at least an effective amount of at least a first cosmetic active agent, the second a cosmetic active agent is Lactobacillus paracasei, a fraction thereof and / or metabolites thereof, the second composition comprising at least an effective amount of the active agent is selected from anti-skin shoulder and at least a second cosmetic active agent for external application. 另一方面，本发明的主题是至少有效量的至少第一美容活性剂和第二美容活性剂用于预防和/或治疗头皮的皮肩问题的美容应用，其中，所述第一美容活性剂为副干酪乳杆菌、其部分和/或其代谢物，所述第二活性剂选自抗皮肩活性剂且为外用的。  On the other hand, the subject of the present invention is at least an effective amount of at least a first cosmetic active agent and a second cosmetic active agent for the prevention and / or treatment of scalp skin cosmetic applications shoulder problems, wherein, said first cosmetic active agent is Lactobacillus paracasei, a fraction thereof and / or metabolites thereof, the second active agent an active agent selected from anti shoulder skin and is for external use. 第一美容活性剂和第二美容活性剂各自被配制在彼此不同的第一美容组合物和第二美容组合物中。  The first and second cosmetic active agent is formulated cosmetic active agent are each different from each other in a first and a second cosmetic composition in a cosmetic composition. 出于本发明的目的，术语“有效量”旨在表示足以获得预期效果，即（尤其是)预防、 减少和/或治疗皮肩问题的量。  For purposes of the present invention, the term "effective amount" is intended to mean an amount sufficient to obtain the desired effect, i.e., (especially) the prevention, reduction and / or amount of the therapeutic shoulder skin problems. 出于本发明的目的，术语“预防”表示完全消除或部分降低（减少）出现特定现象(即本发明中的存在皮肩）的风险。  For purposes of the present invention the term "preventing" indicate a total elimination or partially reduced (reducing) the risk of a particular phenomenon (i.e., in the present invention shoulder skin) occurs. “部分降低(减少)”表示仍然存在风险但程度比实施本发明前小。 "Partial reduction (reduction)" indicates the risk remains but the degree is smaller than the former embodiment of the present invention. 如之前所述，头皮出现过度干燥或过量分泌皮脂可表明有皮肩问题，而皮肩问题根据情况其特征可为存在干燥或油脂性或油性皮肩，或者甚至瘙痒和/或表皮炎症。  As previously described, scalp excessive dryness or excessive secretion of sebum may indicate a problem with a shoulder skin, the shoulder skin problems may be some cases wherein the presence of dry or greasy or oily skin shoulder, or even itching and / or skin inflammation. 干燥皮肩问题反映了头皮的干燥症，其可伴随有头皮角质层的快速过度再生。  drying leather shoulder problem reflects a dry scalp disease, which may be accompanied by excessively rapid regeneration of stratum corneum. 干燥皮肩碎片通常为小且白或灰的形式，且散布在头皮和衣服上，从而产生不雅的视觉效果。 Dried leather shoulder pieces usually small and white or gray form and spread on the scalp and clothing, resulting in unsightly visual effects. 头皮干燥相关的痒可导致红斑、瘙痒或者甚至炎症。  Scalp itch associated with drying can lead to erythema, pruritus or even inflammation. 油脂性或油性皮肩问题是脂溢性皮炎的形式之一。  greasy or oily skin shoulder problem is a form of seborrheic dermatitis. 患有脂溢性皮炎的个体具有覆盖有大且油脂性或油性黄色鳞肩（scale)的红斑性头皮，其中该鳞肩积聚形成小块。  individual suffering from seborrheic dermatitis with large and covered with greasy or oily yellow scales shoulder (Scale) erythematous scalp, wherein a build-up of the small scale shoulder. 个体在感染区域头皮瘙痒，且常常具有灼烧感。 Individuals in the affected areas of the scalp itching, and often have a burning sensation. 病理微生物(尤其是马拉色菌）的存在可扩大这些现象。  the presence of pathological microorganisms (especially Malassezia) may extend these phenomena. 具有由皮脂释放脂肪酸的性质的这些微生物可以破坏表皮的屏障功能，并产生炎症。 These microorganisms having release properties of sebum fatty acids may damage the barrier function of the epidermis and inflammation. 在头皮的皮肩问题期间，皮肤屏障失衡，其整体性和水合受到破坏且其生态菌群被扰乱。  During the shoulder of the scalp skin, skin barrier imbalance, its integrity and its hydration and damage ecoflora is disturbed. 头皮皮肤被刺激且瘙痒，易碎，水合较少且对感染敏感。 Skin irritation and itching of the scalp is, brittle, less hydrated and susceptible to infection. 本发明的益生微生物(尤其是乳杆菌属和/或双歧杆菌属的益生微生物)的应用导致水合和头皮生态菌群重建，和头皮瘙痒减少。  The probiotic microorganism according to the present invention (in particular of the Lactobacillus and / or Bifidobacterium probiotic microorganisms) results in the application of hydration and the ecoflora of the scalp reconstruction, and itchy scalp reduction. 尤其是在下文定义的两个时间内通过口服途径使用本发明的益生微生物和通过外用途径使用抗皮肩活性剂引起水合和生态菌群重建，并降低头皮瘙痒。  In particular, the present invention is defined in the following two time probiotic microorganism by oral route due to hydration and the ecoflora and by topical route reconstruction using anti leather shoulder agent, and reduce itchy scalp. 这种降低反映在抓挠头皮的时间减少和由此引起的屏障功能受损的降低。  This reduction and reduction caused thereby reflecting a decrease in scratching the scalp impaired barrier function of time. 此外， 所述治疗的功效得到显著提高，且进展更快。 In addition, the efficacy of the treatment has been significantly improved, and progress faster. 由此，皮肤刺激较小且瘙痒较少，存在的皮肩降低，甚至消除。  Accordingly, a small skin irritation and itching less, there is a shoulder skin reduced, or even eliminated. -用于预防和/或治疗与头皮的皮肩问题相关的炎症。  - for the prophylaxis and / or treatment of inflammation-related skin of the scalp of the shoulder. 本发明的方法包括至少两个时间，该两个时间彼此连续，共同形成被称为“治疗次序”的次序。  The method of the present invention comprises at least two time, the two time-continuous, the order referred to collectively form a "therapeutically-order" to one another. 本发明的方法包括至少第一治疗次序，或者甚至是多个连续的次序，例如至少两个、三个或四个连续的治疗次序。  The method of the present invention comprises at least a first treatment sequence, or even a plurality of consecutive order, for example at least two, three or four consecutive treatment sequences. 因此，治疗结果可以重复从而实现第一时间和第二时间的连续。  Thus, to achieve therapeutic results may be repeated continuously in a first time and the second time. 有利地，本发明的方法包括重复至少一次，尤其是至少两次且优选至少三次的次序。  Advantageously, the method according to the present invention comprises repeated at least once, in particular at least twice and preferably at least three of the order. 或者，所述连续的治疗次序可以包括在各次序之间的中断治疗期，所述中断治疗期为数天例如1、2、3、4或5天至数周例如1、2、3或4周。  Alternatively, the order may comprise a continuous treatment interruption period between each treatment sequence, the interruption treatment of several days, for example four or five days to several weeks e.g. 1,2,3 or 4 weeks. 所述第一时间和第二时间可以为数天例如1、2、3、4、5、6或7天至数周例如2、3、4、5 或6周。  The first time and the second time may be, for example, several days, or seven days to several weeks, for example, five or six weeks. 根据一个实施方式，所述两个时间可以彼此独立地为1-6周，优选为2-5周，优先为3_4 周。  According to one embodiment, the two time may be independently of one another 1-6 weeks, preferably 2-5 weeks, for the priority 3_4 weeks. 根据一个实施方式，所述第一时间和第二时间可以为不同的持续期。  According to one embodiment, the first and second times may be of different duration. 例如，所述第一时间可以短于第二时间，或者所述第二时间可以短于第一时间。 For example, the first time may be shorter than the second time or the second time may be shorter than the first time. 根据另一个实施方式，所述第一时间等于所述第二时间。  According to another embodiment, the first time is equal to the second time. 每个时间至少施用一次所述活性剂。  Each time the active agent is administered at least once. 优选地，所述时间可以分成时间单元，尤其是相等的持续期，例如数天或数周。 Preferably, the time may be divided into time units, in particular of equal duration, for example, several days or weeks. 在此实施方式中，每个时间单元至少施用一次活性剂，例如至少一天一次。 In this embodiment, at least once per unit of time the active agent is administered, for example, at least once a day. 如之前所述，第一美容活性剂在两个时间均施用，而第二美容活性剂仅在选自第一时间和第二时间之间的单个时间施用。  As described previously, the first cosmetic active agent are administered at two time, and the second cosmetic active agent is administered at a single time only between the selected first and second times. 有利地，可以在第一时间施用第二美容活性剂。  Advantageously, the second cosmetic active agent may be administered in the first time. 因此，根据本发明的一个优选实施方式，本发明的方法可以包括第一时间，所述第一时间包括施用第一美容活性剂和第二美容活性剂，所述第一时间之后为第二时间，第二时间包括在不存在第二美容活性剂的情况下施用第一美容活性剂。  Thus, according to one preferred embodiment of the invention, the method of the present invention may comprise a first time, the first time comprises administering a first cosmetic active agent and a second cosmetic active agent, after the first time a second time, the second time comprises administering a first cosmetic active agent in the absence of the second cosmetic active agent. 根据本发明的另一个优选实施方式，本发明的方法可以包括第一时间，所述第一时间包括在不存在第二美容活性剂的情况下施用第一美容活性剂，所述第一时间之后为第二时间，第二时间包括施用第一美容活性剂和第二美容活性剂。  According to another preferred embodiment of the present invention, the method of the present invention may comprise a first time, the first time includes a first cosmetic active agent is administered in the absence of the second cosmetic active agent, wherein the first after a second time period, the second time cosmetic active agent comprising administering a first and a second cosmetic active agent. 当在不存在第二美容活性剂的情况下施用第一美容活性剂一段时间时，其可以通过本领域技术人员已知的任何途径，尤其是口服或外用并且特别是口服施用。  When the first cosmetic active agent is administered in the period of absence of the second cosmetic active agent, which may be by any route known to the skilled person, in particular oral or topical administration and in particular orally. 由于第一美容活性剂和第二美容活性剂被配制成单独的组合物，因此当它们在相同的时间施用时，它们可以通过相同或不同的施用途径施用。  Since the first cosmetic active agent and a second cosmetic active agent is formulated as separate compositions, so that when they are administered at the same time, they can be administered by the same or different routes of administration. 具体而言，所述第二美容活性剂是外用，所述第一美容活性剂可以为口服或外用，优选口服施用。 In particular, the second cosmetic active agent is topical, the first cosmetic active agent may be administered orally or topically, preferably orally. 当第一美容活性剂和第二美容活性剂在相同的时间施用时，第一美容活性剂和第二美容活性剂可以随时间序贯施用，即，单独地依次连续，即，各在给定时间，或者是同时施用。  When the first cosmetic active agent and a second cosmetic active agent is administered at the same time, the first cosmetic active agent and a second cosmetic active agent may be administered sequentially over time, i.e., separately successively, i.e., each at a given time, or is administered simultaneously. 在相同的时间内，可以以任何顺序(没有优选)施用第一美容活性剂和第二美容活性剂，例如第一活性剂在第二活性剂之前或者第二活性剂在第一活性剂之前。  at the same time, the first cosmetic active agent can be administered and a second cosmetic active agent in any order (preferably not), for example, the first activity of the first active agent prior to a second active agent or a second agent before agents. 在同时施用中，优选首先进行第二美容活性剂的外用，从而使其在第一美容活性剂的口服施用过程中是就位的。  In simultaneous administration, preferably first the second cosmetic active agent for external use, oral administration so that processes a first cosmetic active agent is in place. 根据一个优选的实施方式，第一时间为4周并且包括每天施用一次第一活性试剂和第二活性试剂，第二时间为4周并且包括每天施用一次第一活性试剂和中断第二活性试剂。  According to a preferred embodiment, the first period of four weeks and includes a first active agent and administering a second active agent per day, the second time 4 weeks once daily administration and comprising a first active agent and a second interrupt active agents. 出于本发明的目的，术语“益生微生物”表示当以适当量消费时对宿主产生积极作用的活的微生物（"Joint FA0/WH0 Expert Consultation on Evaluation of Health and Nutritional Properties of Probiotic in Food Including Powder Milk with Live Lactic Acid Bacteria，6 October 2001〃），其尤其可以提高肠内微生物平衡。  For purposes of the present invention, the term "probiotic microorganisms" means a live microorganism when consumed in an appropriate amount have a positive effect on the host ( "Joint FA0 / WH0 Expert Consultation on Evaluation of Health and Nutritional Properties of Probiotic in Food Including Powder Milk with Live Lactic Acid Bacteria, 6 October 2001〃), which in particular can improve the intestinal microbial balance. 根据本发明的一个变式，本发明的微生物可以以分离的形式使用，即不与易于与所述微生物来源培养基中的微生物结合的一种或多种化合物混合。  According to a variant of the present invention, the microorganism of the invention may be used in isolated form, i.e. not mixed easily with the microorganism source in combination with a microorganism culture medium one or more compounds. 出于本发明的目的，术语“代谢物”意指源自本发明的微生物的代谢并且还在头皮的皮肩问题的治疗中具有功效的任何物质。  For the purposes, the term "metabolite" means according to the present invention from microbial metabolism and the treatment of the present invention the shoulder skin problems also have utility in scalp any substance. 出于本发明的目的，术语“部分”更具体地意指所述微生物的片段，其与所述整体微生物的作用类似，对治疗头皮的皮肩问题有效。  For purposes of the present invention the term "portion" more particularly refers to a fragment of said microorganism, with a similar effect to the whole microorganism effective for the treatment of scalp skin shoulder problems. 根据一个优选实施方式，适合本发明使用的所述益生微生物代谢物和/或部分可以以裂解物的形式施用。  According to a preferred embodiment, the present invention is suitable for use in the probiotic microorganism metabolites and / or portions may be administered in the form of a lysate. 出于本发明的目的，“裂解物”通常是指生物细胞通过所谓细胞裂解的现象被破坏或溶解，并由此产生天然包含在所述微生物细胞内的细胞内生物组分的释放后获得的物质。  For purposes of the present invention, a "lysate" generally refers to the destruction or dissolution of biological cells via a phenomenon called cell lysis, and the resulting release of intracellular biological constituents naturally contained in the cells of the microorganism after obtaining the substance. 出于本发明的目的，使用的术语“裂解物”无优选地意指通过所述微生物的裂解获得的整个裂解物或仅其部分。  For purposes of the present invention, the entire lysate term "lysate" preferably means no cleavage by the microorganism or only part thereof is obtained. 因此，所使用的裂解物完全或部分由细胞内生物成分以及细胞壁和细胞膜的成分形成。  Thus, lysate used completely or partially, and the component is formed from a biological cell walls and membranes of the cell. 有利地，本发明使用的裂解物可以为通过所研究微生物的裂解获得的整个的裂解物。  Advantageously, the present invention can be used in the lysate through the whole lysate obtained microorganism lysis studies. 该细胞裂解可以通过多种技术实现，例如渗透压休克、热休克、通过超声处理或者离心类型的机械应力。  The cell lysis can be achieved by various techniques, e.g. osmotic shock, heat shock, sonication or by mechanical stress of centrifugation type. 更具体地，该细胞裂解物可以通过专利US 4464362中描述的技术获得，并且尤其是根据以下方法获得。  More particularly, the cell lysate can be obtained in US 4,464,362 techniques described in the patent, and in particular obtained according to the following method. 具体而言，本发明的裂解物可以通过以下方法获得:超声分裂包含益生微生物的培养基从而从中释放胞质部分、细胞壁片段和源自代谢的产物。  Specifically, lysates of the present invention can be obtained by the following method: ultrasonic disintegration of a medium comprising probiotic microorganisms released therefrom so that the cytosolic fraction, cell wall fragments and the products derived from metabolism. 然后，其天然配给物中的所有成分均被稳定在弱酸性水溶液中。 Then, all components of its natural dispensing thereof are stable in a weakly acidic aqueous solution. 裂解物可以以多种形式使用，如以溶液的形式或粉末的形式。  lysate may be used in various forms, such as in the form of a powder or in the form of a solution. 所述微生物可以以活的、半活性或失活或死亡的形式包含在本发明的组合物中。  The microorganism may be included in the compositions of the present invention to live, semi-active or inactivated or dead form. 出于本发明的目的，“失活”或“死亡”的微生物是不再能够在培养中形成集落的微生物。  For purposes of the present invention, "inactivation" or "dead" microorganism is a microorganism is no longer capable of forming colonies in culture. 所述死亡或失活微生物可以具有完整的或破碎的细胞膜。 The dead or inactivated microorganisms may have intact or broken cell membrane. 所述死亡或死亡微生物可以通过本领域技术人员已知的任何方法获得。 The death or dead microorganisms can be obtained by any method known to the skilled person. 根据一个实施方式，适合本发明应用且尤其适合本发明方法的益生微生物可以选自乳杆菌属、双歧杆菌属、球菌(Cocci)、酵母和产孢子细菌及其混合物。  According to one embodiment, the present invention is suitable for use and method of the present invention are particularly suitable probiotic microorganism may be selected from Lactobacillus, Bifidobacterium, Lactococcus (Cocci), yeasts and sporulated bacteria, and mixtures thereof. 优选地，适合本发明应用的微生物为益生微生物，尤其是乳杆菌属和/或双歧杆菌属的益生微生物。  Preferably, the microorganism of the present invention is suitable for use as a probiotic microorganism, especially of the Lactobacillus and / or Bifidobacterium probiotic microorganisms. -及其混合物。  - and mixtures thereof. 作为适合本发明的益生微生物的另一个实例，可以提及青春双歧杆菌、动物双歧杆菌、两歧双歧杆菌、短双歧杆菌、乳双歧杆菌、长双歧杆菌、婴儿双歧杆菌、假小链双歧杆菌，嗜酸乳杆菌(Lactobacillus acidophilus) NCFB1748、食淀粉乳杆菌、干酪乳杆菌(干酪乳杆菌代田株(Lactobacillus casei Shirota)、鼠李糖乳杆菌株GG、短乳杆菌、卷曲乳杆菌、保加利亚乳杆菌(Lactobacillus bulgaricus)、德氏乳杆菌亚种(德氏乳杆菌乳亚种）、 发酵乳杆菌、瑞士乳杆菌、鸡乳杆菌、格氏乳杆菌、约氏乳杆菌CNCM 1-1225、植物乳杆菌、罗伊氏乳杆菌、唾液乳杆菌、消化乳杆菌、弯曲乳杆菌、干酪乳杆菌干酪亚种、清酒乳杆菌(LactobaciIIus sake)、乳酸乳球菌、类肠球菌、屎肠球菌、乳酸乳球菌乳亚种、乳酸乳球菌乳脂亚种、肠膜明串珠菌右旋葡聚糖亚种、乳酸片球菌、菊糖芽孢乳杆菌、  As another example of the present invention suitable probiotic microorganisms, mention may be made of Bifidobacterium adolescentis, Bifidobacterium animalis, Bifidobacterium bifidum, Bifidobacterium breve, Bifidobacterium lactis, Bifidobacterium longum, baby bifidobacteria, Bifidobacterium pseudocatenulatum, Lactobacillus acidophilus (Lactobacillus acidophilus) NCFB1748, Lactobacillus amylovorus, Lactobacillus casei (Lactobacillus casei Shirota strain (Lactobacillus casei Shirota), Lactobacillus rhamnosus strain GG, short Lactobacillus, curly Lactobacillus, Lactobacillus bulgaricus (Lactobacillus bulgaricus), Lactobacillus delbrueckii subspecies (Lactobacillus delbrueckii subsp. lactis), Lactobacillus fermentum, Lactobacillus plantarum, Lactobacillus chicken, Grignard Lactobacillus, yOELII Lactobacillus CNCM 1-1225, Lactobacillus plantarum, Lactobacillus reuteri, Lactobacillus salivarius, Lactobacillus digestion, bending Lactobacillus casei subsp cheese, Lactobacillus sake (LactobaciIIus sake), Lactococcus lactis, intestinal class lactis, feces Enterococcus, Lactococcus lactis, Lactococcus cremoris, Leuconostoc mesenteroides subsp dextran bacteria, Pediococcus acidilactici, Sporolactobacillus inulin, 液链球菌嗜热亚种、嗜热链球菌、肉葡萄球菌、木糖葡萄球菌、酿酒酵母、布拉酵母（Saccharomyces boulardii)、錯样芽胞杆菌toyo变种或錯样芽胞杆菌枯草变种（Bacillus cereus var subtilis)、凝结芽孢杆菌、地衣芽孢杆菌、埃希氏大肠杆菌nissle株和费氏丙酸杆菌，及其混合物。 Subsp thermophilus Streptococcus liquid, Streptococcus thermophilus, Staphylococcus carnosus, Staphylococcus xylosus, Saccharomyces cerevisiae, Saccharomyces boulardii (Saccharomyces boulardii), mistaken or Bacillus cereus var toyo from Bacillus subtilis var error (Bacillus cereus var subtilis), Bacillus coagulans, Bacillus licheniformis, Escherichia coli strain nissle and Propionibacterium freudenreichii, and mixtures thereof. 更具体地，适合本发明的益生微生物可选自乳杆菌种、芽孢乳杆菌种(Sporolactobacillus sp. )、肠球菌种、乳球菌种、杆菌种、链球菌种（Streptococcus sp. )、片球菌种、明串珠菌种和双歧杆菌种，并且尤其选自乳杆菌种和双歧杆菌种，及其混合物。  More particularly, the present invention is suitable probiotic microorganisms may be selected from Lactobacillus species, Lactobacillus species Bacillus (Sporolactobacillus sp. ), Enterococcus species, Lactococcus species, Lactobacillus species, Streptococcus species (Streptococcus sp. ), Pediococcus species, Leuconostoc species and Bifidobacterium species and Lactobacillus species and in particular is selected from Bifidobacterium species, and mixtures thereof. 更具体地，可用于本发明的微生物可以为选自乳杆菌种和/或双歧杆菌种的益生微生物。  More specifically, the microorganism can be used in the present invention may be selected from the species Lactobacillus and / or Bifidobacterium species probiotic microorganisms. 作为这些益生微生物的示例，更尤其可以提及约氏乳杆菌、罗伊氏乳杆菌、鼠李糖乳杆菌、副干酪乳杆菌、干酪乳杆菌、两歧双歧杆菌、短双歧杆菌、长双歧杆菌、动物双歧杆菌、乳双歧杆菌、婴儿双歧杆菌、青春双歧杆菌和假小链双歧杆菌及其混合物。  As an example of these probiotic microorganisms, mention may be made more particularly of Lactobacillus johnsonii, Lactobacillus reuteri, Lactobacillus rhamnosus, Lactobacillus paracasei, Lactobacillus casei, Bifidobacterium bifidum, Bifidobacterium bacteria, Bifidobacterium longum, Bifidobacterium animalis, Bifidobacterium lactis, Bifidobacterium infantis, Bifidobacterium and false small chain Bifidobacterium and mixtures thereof. 有利地，适合本发明的微生物可以为乳酸益生微生物。  Advantageously, the microorganism may be suitable for the present invention is a lactic acid probiotic microorganism. 根据一个优选实施方式，适合本发明使用的益生微生物尤其可以为乳杆菌属的微生物。  According to a preferred embodiment, the present invention is suitable for use in particular probiotic microorganism may be a microorganism of the genus Lactobacillus. 根据本发明的一个具体实施方式，所述微生物不是鼠李糖乳杆菌。  According to a particular embodiment of the present invention, the microorganisms are not Lactobacillus rhamnosus. 优选地，适合本发明的乳杆菌属微生物可以选自以下种:约氏乳杆菌、罗伊氏乳杆菌、副干酪乳杆菌和干酪乳杆菌及其混合物。  Preferably, the present invention is suitable microorganism of the genus Lactobacillus may be selected from the following species: Lactobacillus johnsonii, Lactobacillus reuteri, Lactobacillus paracasei and Lactobacillus casei, and mixtures thereof. 根据一个优选实施方式，适合本发明的微生物可以为副干酪乳杆菌。  According to a preferred embodiment, a microorganism suitable for the invention may be a Lactobacillus paracasei. 适合本发明的微生物尤其可以为根据布达佩斯条约于1999年1月12日保藏在巴斯德研究所（Pasteur Institute) (28 rue du Docteur Roux，F_75024 Pariscedex 15)的命名为CNCM 1-2116的副干酪乳杆菌STll菌株和/或其部分和/或其代谢物。  The present invention is particularly suitable microorganisms can be according to the Budapest Treaty on January 12, 1999 deposited at the Institut Pasteur (Pasteur Institute) (28 rue du Docteur Roux, F_75024 Pariscedex 15) named CNCM 1-2116 STll Lactobacillus paracasei strain and / or portions thereof and / or metabolites thereof. 根据另一个优选实施方式，适合本发明使用的益生微生物尤其可以为双歧杆菌属的微生物，并且尤其是长双歧杆菌，尤其为长双歧杆菌(BB536)的微生物。  According to another preferred embodiment, the present invention is suitable for use in particular probiotic microorganism may be a microorganism of the genus Bifidobacterium and in particular Bifidobacterium longum, especially Bifidobacterium longum (BB536) microorganisms. 有利地，长双歧杆菌可以以裂解物，尤其是按照上述获得的裂解物的形式使用。  Advantageously, a Bifidobacterium longum may be used in particular in the form of lysates to lysates obtained above. 本发明的微生物可以以相对于包含其的组合物总重量计至少0.0001 % (以干重表示）的比例，尤其是0.0001重量％-20重量％的比例，更尤其是0.001重量％-15重量％，尤其是0.01重量％-10重量％，尤其是0.1重量％-2重量％配制在组合物中。  The microorganism of the present invention may be contained with respect to the ratio of the weight of the total composition of at least 0.0001% (by dry weight), in particular the proportion of 0.0001 wt% to 20 wt%, more particularly 0.001% by weight - 15% by weight, in particular 0.01 wt% to 10 wt%, in particular 0.1 wt% to 2 wt% formulated in the composition. 通常，本发明的组合物，尤其是旨在口服施用的组合物可以包含的活微生物每克载体或支持物含l〇3_l〇15cfu/g，尤其是105-1015cfu/g，更尤其是107-1012cfu/g微生物，或者与对失活或死亡微生物或者微生物部分或者产生的代谢物所计算的相当的剂量。  Generally, the compositions of the present invention, particularly compositions intended for oral administration may contain live microorganisms per gram of carrier or support containing l〇3_l〇15cfu / g, especially 105-1015cfu / g, more particularly is 107-1012cfu / g of microorganisms, or the equivalent dose of inactivated or dead microorganisms or microbial metabolites produced partially or calculated. 具体而言，在口服施用的组合物中，可以将相应微生物和/或部分和/或代谢物的浓度调整为5 X IO5-IO13Cfu/天，尤其是IO8-IO11Cfu/天的剂量(用微生物相当量表示）。  Specifically, the composition for oral administration may be appropriate microorganisms and / or partially and / or metabolite concentration adjusted to 5 X IO5-IO13Cfu / day, particularly a dose IO8-IO11Cfu / day ( is represented by an equivalent amount of microorganisms). 本发明的外用组合物通常可以包含103-1012cfu/g，尤其是105-101QCfu/g并且更尤其是107-109cfu/g微生物。  The topical compositions of the invention may generally comprise 103-1012cfu / g, especially 105-101QCfu / g and more especially 107-109cfu / g of microorganisms. 在外用的具体情况下，使用失活或者甚至是死亡形式的微生物可能是有利的。  In the specific case of topical use of inactivated or even dead form of microorganisms may be advantageous. 所述微生物还可以以细胞组分的部分的形式或者代谢物的形式被包含。  The microorganism may be further contained as in the form of metabolites or cellular component part. 所述微生物、代谢物或部分还可以以冻干粉的形式、培养物上清液和/或适当地以浓缩形式被包含。 The microorganism may also be metabolites or partially in the form of a lyophilized powder, a culture supernatant and / or is contained in a suitably concentrated form. 当组合物包含代谢物时，代谢物在所述组合物中的含量基本对应于这样的含量， 该含量可以满足每克支持物或载体产生l〇3-l〇15cfu，尤其为IO5-IO15Cfu，更尤其为IO7-IO12Cf u活微生物。  When the composition comprises metabolites, the contents of metabolites in the compositions correspond substantially to such content, which meet per gram support or carrier-generating l〇3 l〇15cfu, especially IO5 -IO15Cfu, more specifically IO7-IO12Cf u live microorganisms. 微生物的代谢物或部分的量(cfu)或死亡微生物的量的表述旨在表示产生所述量的微生物代谢物或部分所必需的该微生物的量。  The amount of metabolites or fractions of microorganisms (cfu) or dead microorganisms or expression generating section is intended to mean the amount required for the amount of microorganism microbial metabolites. 根据一个实施方式，利用至少一种本发明的益生微生物(尤其是乳杆菌属和/或双歧杆菌属)的本发明的应用(尤其是本发明的方法)可以与其他或者第三美容活性剂组合。 Applications  According to one embodiment, the use of at least one probiotic microorganism according to the present invention (in particular of the Lactobacillus and / or Bifidobacterium sp) of the present invention (in particular, the method according to the invention) may be third or other cosmetic active agents. 与所述的施用方法无关，有效量的本发明微生物、其部分和/或其代谢物还可以有利地与至少一种其它活性剂组合。  irrespective of the method of administration, an effective amount of a microorganism of the present invention, portions thereof and / or a metabolite thereof may also be advantageously at least one other active agent combination. 更具体地，根据一个实施方式，除了施用之前定义的第一美容活性剂和第二美容活性剂以外，本发明的方法还可以包括施用至少第三美容活性剂或其他美容活性剂。  More specifically, according to one embodiment, the first cosmetic active agent in addition to the previously defined and administering a second cosmetic active agent, the method of the present invention may further comprise administering at least a third cosmetic active agent, or other cosmetically active agent. 可以无优选地施用第三美容活性剂持续之前定义的一段时间或另一段时间，或者甚至为两段时间。  The third cosmetic active agent may be administered without prior preferably for another defined period of time or a period of time, or even two times. 可以将第三美容活性剂与之前定义的第一美容活性剂和/或第二美容活性剂配制在一起，或者可以配制在单独的组合物中。  The third cosmetic active agent may be the first cosmetic active agent and / or a second cosmetic active agents defined previously formulated together, or may be formulated in separate compositions. 当第三美容活性或其他美容活性剂被配制在独立于包含第一美容活性剂和第二美容活性剂的组合物的组合物中时，第三美容活性或其他美容活性剂可以口服或外用。  When the third or additional cosmetic active agent may be formulated in a cosmetic composition independently comprising a first cosmetic active agent and a second cosmetic active agent composition, or other cosmetically active third cosmetic active agent may be administered orally or topical. 本领域技术人员选择施用途径从而可以更尤其适合于第三美容活性剂的性质。 Those skilled in the art to select particular route of administration can be more appropriate to the nature of the third cosmetic active agent. 有利地，此其他美容活性剂或第三美容活性剂可以旨在对头发和/或头皮发挥美容、护理或清洁作用，并且尤其可以旨在增强皮肤屏障。  Advantageously, this cosmetic active agent or other third cosmetic active agent may be intended for the hair and / or scalp play a beauty, care or cleaning action, and in particular, can be designed to enhance the skin barrier. 根据一个实施方式，适合本发明方法的第三美容活性剂或其他美容活性剂尤其可以选自染发剂、防止脱发和/或促进生发的试剂、顺发剂(detangler)、头发定型剂、用于预防和/或治疗秃头的试剂、抗皮脂溢剂、抗生素、激素、抗雄激素物质、其他益生微生物(尤其是长双歧杆菌或线状透明颤菌(Vitreoscilla filiformis)的裂解物）、水合剂、抗氧化剂和维生素及其混合物。  According to one embodiment, the method of the present invention is suitable for a third cosmetic active agent, or other cosmetic active agent may be selected from dyes in particular, to prevent hair loss and / or hair growth promoting agent, cis-initiator (detangler), hairspray for the prevention and / or treatment of baldness agents, antiseborrheic agents, antibiotics, hormones, anti-androgens, other probiotic microorganism (especially Bifidobacterium longum or Vitreoscilla filiformis (Vitreoscilla filiformis) lysate) , hydrating agents, antioxidants and vitamins, and mixtures thereof. 此制剂可有利地扩大本发明的微生物的有益效果。  This formulation can be advantageously expanded beneficial effects of a microorganism of the present invention. 根据另一个实施方式，本发明的外用或口服组合物或组合可以包含选自抗脂溢活性剂、水合活性剂、下述抗皮肩活性剂和/或其混合物中的至少一个活性剂。  According to another embodiment, topical or oral composition or combination of the present invention may comprise an anti-seborrhoeic active agent is selected from the at least one active agent hydration, anti-skin shoulder following active agents and / or mixtures thereof agents. -抗脂溢活性剂。  - anti-seborrhoeic active agent. 术语“抗脂溢活性剂”旨在表示能够调节皮脂腺活性的化合物。 The term "antiseborrhoeic active agent" is intended to mean a compound capable of regulating sebaceous gland activity. 相对于所述组合物总重量，所述抗脂溢活性剂的存在量为，例如〇.1%_1〇% (重量），优选0.1%-5% (重量），优先为0.5%_3% (重量）。 Relative to the total weight of the composition, the anti-seborrhoeic active agent is present in an amount of, e.g. 〇.1 _1〇%% (wt. ), Preferably from 0.1% to 5% (by weight), preferentially 0.5% _3% ( weight). -水合活性剂。  - the active agent hydration. 水合活性剂为能够减少表皮干燥状态的活性剂。 Hydrated active agent is capable of reducing the state of dryness of an epidermis of the active agent. -或者激活皮脂腺的化合物，例如类固醇衍生物（包括DHEA)和维生素D及其衍生物。  - activation of sebaceous glands, or compounds, such as steroid derivatives (including DHEA), and vitamin D and its derivatives. 这些化合物可以占本发明组合物总重量的0.001 % -3 %，并且优选0.01 % -20 %。 These compounds  may be 0.001% to 3% of the total weight of the composition of the present invention, and preferably from 0.01% to 20%. 作为脲衍生物的示例，更尤其可以提及羟基烷基脲衍生物，并且尤其是FR 2877222文献中描述的物质。  As examples of the urea derivatives, mention may be made more particularly hydroxyalkyl urea derivatives, and in particular substance FR 2877222 described in the literature. 根据一个实施方式的变式，可用于本发明方法的第三美容活性剂或其他美容活性剂可以为称作“第二微生物”的微生物，尤其是益生菌型微生物，和/或其部分和/或其代谢物，其不同于被定义为第一美容活性剂的所述第一微生物。  According to a variant embodiment of the embodiment, the present invention can be used in the methods of the third cosmetic active agent, or other cosmetic active agent may be a microorganism referred to as a "second microorganism", in particular probiotic microorganism, and / or portions and / or metabolites thereof, which are defined as different from the first cosmetic active agent of the first microorganism. 根据一个变化的实施方式，本发明涉及除了第一益生微生物如以上所定义的乳杆菌属和/或双歧杆菌属外的不同于所述第一微生物的至少有效量的至少第二微生物(尤其是益生型)和/或其部分和/或其代谢物的应用。  According to one variant embodiment, the present invention relates in addition to a first Lactobacillus probiotic microorganism as defined above and / or Bifidobacterium microorganisms different from the first at least an effective amount of at least a second microorganisms (especially of probiotic type) and / or portions thereof and / or metabolites applications. 出于本发明的目的，之前出现的表述“不同于所述第一益生微生物”的表述表示可以在同一组合物中区分两种不同的微生物或同一微生物的两种不同形式。  For purposes of the present invention, the expression before the appearance of "different from said first probiotic microorganism" shall mean can distinguish between two different forms of the same or of two different microorganisms microorganisms same composition. 因此，当第二微生物为，例如乳杆菌属或双歧杆菌属并对应于与本发明相同的种时，则所述第二微生物以不同于第一微生物的形式存在。 Thus, when the second microorganism is, for example, Lactobacillus or the genus Bifidobacterium of the present invention and corresponds to the same species, then the second microorganism present in the form different from the first microorganism. 第二益生微生物可以配制在包含第一美容活性剂的同一组合物中，或者配制在包含第二美容活性剂的同一组合物中，或者可以配制在独立于上述组合物的第三组合物中。  The second probiotic microorganism may be formulated in the same composition comprising a first cosmetic active agent, or formulated in the same composition comprising a second cosmetic active agent, or may be formulated in separate compositions to the third combination It was. 更具体地，第二益生微生物可以为本文上述益生微生物之一，如第一美容活性剂的益生微生物的具体实例或者“第二微生物”。  More specifically, the second probiotic microorganism may be one of the probiotic microorganisms described herein above, specific examples of probiotic microorganisms such as first cosmetic active agent, or "second microorganism." 该第二微生物尤其可以选自子囊菌纲，例如酵母属，耶罗威亚酵母属，克鲁维酵母属，孢圆酵母属，粟酒裂殖酵母属，德巴利酵母属，假丝酵母属，毕赤酵母属，曲霉属和青霉属，拟杆菌属、梭杆菌属、蜜蜂球菌属、丙酸杆菌属、肠球菌属、乳球菌属、葡萄球菌属、消化链球菌属、杆菌属、片球菌属、微球菌属、明串珠菌属、魏斯氏菌属、气球菌属、酒球菌属、乳杆菌属或双歧杆菌属的细菌，以及其混合物。  In particular, the second microorganism may be selected from Ascomycetes, e.g. Saccharomyces, Yarrowia Saccharomyces, Kluyveromyces, the genus Fusarium Torula, Schizosaccharomyces pombe, Saccharomyces, Debaryomyces, Candida, Pichia, Aspergillus and Penicillium, Bacteroides, Fusobacterium, bees, Lactococcus, Propionibacterium, Enterococcus, Lactococcus, Staphylococcus, Peptostreptococcus , Bacillus, Pediococcus, Micrococcus, Leuconostoc, Weissella, Aerococcus, Oenococcus, Lactobacillus or Bifidobacterium bacteria, and mixtures thereof. 更具体地，第二微生物可以为本文上述益生微生物之一，如第一微生物的益生微生物的具体实例。  More particularly, the second microorganism may be one of the probiotic microorganisms described herein above, as specific examples of probiotic microorganisms to the first microorganism. 根据一个具体的实施方式，第三美容活性剂或其他美容活性剂为乳杆菌属，尤其是约氏乳杆菌的第二益生微生物、其部分和/或其代谢物。  In accordance with one specific embodiment, the third cosmetic active agent, or other cosmetically active agent is a Lactobacillus, in particular the second probiotic microorganism is Lactobacillus johnsonii, a fraction thereof and / or metabolites thereof. 最尤其合适的种为根据布达佩斯条约分别于1992年6月30日、1999年1月12日、 1999年4月15日、2005年6月7日保藏在巴斯德研究所（28 rue du Docteur Roux，F-75024 Paris cedex 15)的命名为CNCM I-1225、CNCMI-2168、CNCM 1-2170和CNCM 1-3446的约氏乳杆菌、青春双歧杆菌、长双歧杆菌和乳双歧杆菌NCC 2818,和长双歧杆菌(BB536)属及其混合物。  In particular, the most suitable for the species under the Budapest Treaty on June 30, 1992, 1999 January 12, 1999 April 15, 2005, June 7, respectively, deposited at the Institut Pasteur (28 rue du Docteur Roux, F-75024 Paris cedex 15) named CNCM I-1225, CNCMI-2168, CNCM 1-2170 and CNCM 1-3446's about Lactobacillus, Bifidobacterium, Lactobacillus and Bifidobacterium longum Bifidobacterium NCC 2818, Bifidobacterium longum (BB536) genus, and mixtures thereof. 根据一个具体的实施方式，第二益生微生物为乳杆菌属(尤其是约氏乳杆菌种）、 其部分和/或其代谢物。  In accordance with one specific embodiment, the second probiotic microorganism of the genus Lactobacillus (particularly Lactobacillus species), partially and / or a metabolite thereof. 第二益生微生物具体可以为根据布达佩斯条约于1992年6月30日分别保藏在巴斯德研究所（28 rue du Docteur Roux，F-75024 Paris cedex 15)的命名为CNCM 1-1225的约氏乳杆菌种。  The second probiotic microorganism may be specifically under the Budapest Treaty on June 30, 1992, respectively, deposited at the Pasteur Institute named (28 rue du Docteur Roux, F-75024 Paris cedex 15) for the CNCM 1-1225 Lactobacillus species. 根据另一个具体的实施方式，第三美容活性剂或其他美容活性剂为双歧杆菌属并且尤其为长双歧杆菌(特别是长双歧杆菌(BB536))的第二益生微生物。  According to another specific embodiment, the third, or other cosmetically active agent is a cosmetically active agent and in particular Bifidobacterium longum (in particular Bifidobacterium longum (BB536)) a second probiotic microorganism. 根据一个实施方式，当第三美容活性剂或其他美容活性剂为第二益生微生物时， 其可以有利地以裂解物(尤其是通过上述方法获得）的形式使用。  According to one embodiment, the second probiotic microorganism, it may advantageously lysates (obtained by the above process in particular) when the third cosmetic active agent, or other cosmetically active agent is used in the form. 具体而言，第二益生微生物可以为长双歧杆菌的裂解物。 Specifically, the second probiotic microorganism may be a lysate of Bifidobacterium longum. 根据再一个实施方式，可以为适合本发明应用的其他微生物的第三美容活性剂或其他美容活性剂可选自非光合作用的丝状菌和/或其部分和/或其代谢物。  According to a further embodiment, may be selected from non-photosynthetic filamentous bacteria and / or portions thereof and / or metabolites thereof as a third cosmetic active agent, or other cosmetically active agent other microorganisms suitable for use in the present invention . 这些细菌还可以有利地以裂解物的形式进行配制。 These bacteria may also be advantageously formulated in lysate form. 作为这些细菌的示例，尤其可以提及根据Bergey's Manual of Systematic Bacteriology (Vol.3，sections 22 and 23,9th edition，1989)的分类所定义的非光合作用丝状菌，在所述非光合作用丝状菌中可以提及的有属于贝氏硫菌目(Beggiatoales)的细菌，并且更尤其是属于贝氏硫菌属、透明颤菌属(Vitreoscilla)、无色菌属(Flexithrix)或亮发菌属(Leucothrix)的细菌。  As an example of these bacteria, mention may be made according to Bergey's Manual of Systematic Bacteriology (Vol.3, sections 22 and 23,9th edition, 1989) classified as non-photosynthetic filamentous bacteria as defined in the non- photosynthesis filamentous bacteria may be mentioned bacteria belonging to have Belleville thiophanate mesh (Beggiatoales), and more particularly belonging to the genus Belleville sulfur, Vitreoscilla sp (Vitreoscilla), as a colorless species (, Flexithrix) or Illuminating genus (Leucothrix) bacteria. 根据本发明的实施方式，其他活性剂或第三活性剂，例如本发明的外用组合物或口服组合物或其组合中的其他活性剂或第三活性剂，可以为尤其旨在增强皮肤屏障的活性剂。  According to embodiments of the present invention, other active agents or third active agents, such as other active agents or third active agent compositions of the invention for external use or oral compositions, or combinations thereof, it may be particularly aimed at enhancing an active agent skin barrier. 作为可以使用的其他活性剂或第三活性剂，可以提及维生素，例如维生素A、B3、 135、136、138、(]、04或?？;抗氧化剂，例如类姜黄素(〇111'〇11111；[110丨(18)、类胡萝卜素、多酸;无机(或矿物)化合物;糖;氨基酸;含硫氨基酸;3和6多聚不饱和脂肪酸;牛磺酸和植物甾醇。  Examples of other active agents or third active agents that may be used, mention may be made of vitamins, such as vitamin A, B3, 135,136,138, (], 04 or ?? ; antioxidants such as curcuminoids (square 111'〇11111; [110 Shu (18), carotenoids, acid; inorganic (or minerals) compounds; sugars; amino; sulfur containing amino acid; 3 and 6 polyunsaturated fatty acids; taurine and phytosterols. 具体而言，可以使用包含维生素C和E的抗氧化复合物，和至少一种类胡萝卜素，尤其是选自胡萝卜素、番茄红素、虾青素(astaxanthine)、玉米黄质和叶黄素的类胡萝卜素， 类黄酮如儿茶酸，原花青素(proanthocyanidins)，花青素(anthocyanins)，泛醌，含多酸和/或二砲稀的咖啡提取物，菊苣提取物，银杏(ginkgo biloba)提取物，富含原花青素的葡萄提取物，辣椒提取物，大豆提取物，具有抗氧化性质的类黄酮的其它来源，脂肪酸，益生元(prebiotics)，牛磺酸，白藜芦醇、含硒的氨基酸和谷胱甘肽前体。  Specifically, containing vitamins C and E antioxidant compound, and at least one carotenoid, especially from carotene, lycopene, astaxanthin (astaxanthine), zeaxanthin and leaves flavin carotenoids, flavonoids such as catechins, proanthocyanidins (proanthocyanidins), anthocyanins (anthocyanins), ubiquinone containing the polyacid and / or the Second Artillery dilute coffee extract, chicory extract, ginkgo (Ginkgo biloba) extract, proanthocyanidin-rich grape extract, capsicum extract, soy extract, antioxidant properties have other sources of flavonoids, fatty acids, prebiotic (prebiotics), taurine, resveratrol, containing and glutathione amino acid precursors selenium. 在类黄酮中，尤其优选类黄酮和OPC (寡聚原花青素）。  In flavonoids, the flavonoids and especially preferred OPC (oligomeric proanthocyanidins). 还可以包含至少一种益生元或益生元的混合物。  The mixture may further comprise at least one prebiotic or a prebiotic. 更具体地，这些益生元可选自由葡萄糖、半乳糖、木糖、麦芽糖、蔗糖、乳糖、淀粉、木聚糖、半纤维素或菊粉产生的寡糖，例如阿拉伯型胶(gums of acacis type)，或其混合物。 More particularly, these prebiotics may be selected from glucose, galactose, xylose, maltose, sucrose, lactose, starch, xylan, hemicellulose or inulin oligosaccharides produced, such as acacia gum (gums of acacis type ), or mixtures thereof. 更具体地，所述寡糖包括至少一种低聚果糖。 More particularly, the oligosaccharide comprises at least one fructooligosaccharide. 更具体地，该益生元可以包括低聚果糖和菊粉的混合物。 More particularly, this prebiotic may comprise a mixture of fructooligosaccharide and inulin. 在外用的草本制剂(galenic form)中，更尤其可以使用蛋白或蛋白水解物，氨基酸，多元醇(尤其是C2-Ciq多元醇），例如甘油、山梨糖醇、丁二醇和聚乙二醇，脲，尿囊素，糖和糖衍生物，水溶性维生素，淀粉和细菌提取物或者植物提取物(如芦荟(Aloe Vera)提取物)作为亲水性活性剂。  In the topical galenic (galenic form), and more in particular to use proteins or protein hydrolysates, amino acids, polyhydric alcohols (especially C2-Ciq polyhydric alcohols) such as glycerin, sorbitol, polyethylene glycol, and glycols, urea, allantoin, sugars and sugar derivatives, water-soluble vitamins, starch, and bacterial extracts or plant extracts (e.g., aloe (aloe Vera) extract) was used as a hydrophilic active agent. 对于亲水性活性剂，可以使用视黄醇(维生素A)及其衍生物，生育酚(维生素E)及其衍生物，神经酰胺，精油和未皂化的物质（生育三烯酚、芝麻素、γ-谷维素、植物留醇、角藍稀、錯和砲稀）。  For hydrophilic active agent, retinol (vitamin A) and its derivatives, tocopherol (vitamin E) and derivatives thereof, ceramides, essential oils and unsaponifiable materials (tocotrienol, sesamin, [gamma] oryzanol, plants remain alcohol, blue angle dilute, dilute guns and wrong). 作为还可以在口服植物制剂中与本发明的微生物、其部分和/或其代谢物组合的其他活性剂或第三活性剂，也可以考虑通常使用的和/或允许使用的任何成分。  As may also be a plant oral preparations and microorganisms of the invention, a fraction thereof and / or other active metabolite or third active agents in combination, may be considered generally used / or any components and allowed . 作为示例，可提及维生素，矿物质，基本脂，微量元素，多酚，类黄酮，植物雌激素， 抗氧化剂如硫辛酸和辅酶QlO，类胡萝卜素，益生元，蛋白和氨基酸，单糖和多糖，氨基糖，植物甾醇和植物来源的三萜醇。  By way of example, mention may be made of vitamins, minerals, fat base, trace elements, polyphenols, flavonoids, phytoestrogens, antioxidants such as lipoic acid and coenzyme QLO, carotenoids, prebiotics, proteins and amino acids, monosaccharides and polysaccharides, amino sugars, phytosterols and triterpenic alcohols of plant origin. 其他这尤其可以包括维生素A、C、D、E、PP和B族维生素。  This may include, among other vitamin A, C, D, E, PP and group B vitamins. 在类胡萝卜素中，优选β-胡萝卜素、番茄红素、叶黄素、玉米黄质和虾青素。 In carotenoids, preferably β- carotene, lycopene, lutein, zeaxanthin and astaxanthin. 尤其使用的矿物质和微量元素为锌、钙、镁、 铜、铁、碘、锰、硒和铬(III)。 In particular, the use of minerals and trace elements are zinc, calcium, magnesium, copper, iron, iodine, manganese, selenium and chromium (III). 在多酚化合物中，还尤其选择来自葡萄、茶、橄榄、可可、咖啡、苹果、蓝莓、接骨木莓、草莓、蔓越莓或洋葱的多酚。  In the polyphenol compounds, in particular also choose from grape, tea, olive, cocoa, coffee, apple, blueberry, elderberry raspberries, strawberries, cranberries or onion polyphenols. 优选地，在植物雌激素中，选择游离异黄酮或糖基化形式的异黄酮，例如染料木黄酮、黄豆苷原、黄豆黄素(glycitein)或木酚素，尤其选择来自亚麻和五味子(Schizandra chinensis)白勺异黄酉同。 Preferably, the phytoestrogens, isoflavones in free or selected glycosylated form of isoflavones, such as genistein, daidzein, glycitein (glycitein) or lignans, in particular selected from flax and Schisandra (of Schizandra chinensis) unitary with white spoon isoflavones. 所述氨基酸例如牛磺酸、苏氨酸、半胱氨酸、色氨酸或蛋氨酸或含有它们的肽和蛋白。  The amino acids such as taurine, threonine, cysteine, methionine, or tryptophan, or peptides and proteins containing them. 所述脂优选属于含有单不饱和脂肪酸和多不饱和脂肪酸的油的组，如油酸，亚油酸，α_ 亚油酸，γ -亚油酸，十八碳四烯酸，长链鱼ω -3脂肪酸，如EPA和DHA，以及源自植物或动物的共辄脂肪酸，如CLAs (共辄亚油酸）。 The lipid preferably belonging to the group comprising fatty acids and monounsaturated fatty acids, polyunsaturated oils, such as oleic acid, linoleic acid, linoleic # alpha # _, γ - linoleic, stearidonic acid, long-chain fish ω 3 fatty acids, such as EPA and DHA, as well as plant or animal derived fatty acids were noir, such as CLAs (co Noir linoleic acid). 因此，具体地，口服施用的本发明的微生物、其部分和/或其代谢物，还可以与至少一种营养活性剂组合，所述营养活性剂选自番茄红素、维生素C、维生素E和多酚化合物。  Thus, in particular, the microorganisms of the invention for oral administration, in part, and / or a metabolite thereof, may also be at least one nutritional active agent in combination with the nutritional agent is selected from lycopene, vitamin C, vitamin E and polyphenolic compounds. -具有水合或其它免疫调节性质的营养成分，例如青石莲(Polypodiumleucotomos)提取物，富含ω-3脂肪酸和ω-6脂肪酸(包括γ -亚油酸）的植物油或深海鱼油。  - hydrated nutrients or other immunomodulatory properties, e.g. bluestone lotus (Polypodiumleucotomos) extract, rich in ω-3 fatty acids and ω-6 fatty acids (including gamma] - linoleic acid) vegetable oil or fish oil. 本发明的方法包括抗皮肩活性剂的应用。 The method  according to the present invention comprises applying an anti-skin agent of the shoulder. 根据另一个实施方式，本发明的至少一种益生微生物(并且尤其是乳杆菌属和/或双歧杆菌属)的应用还可以包括抗皮肩剂的应用。 Applications  According to another embodiment, the present invention is at least one probiotic microorganism (and in particular of the Lactobacillus and / or Bifidobacterium spp.) May also include an application of an anti-skin agent shoulder. 术语“抗皮肩活性剂”旨在表示能够防止皮肩出现、降低皮肩量和/或使皮肩完全消失的化合物。  The term "anti shoulder skin active agent" is intended to mean the shoulder can prevent occurrence skin, reducing the amount of shoulder skin and / or leather shoulder compound disappears completely. 可以特别提及的抗皮肩剂的优选实例包括吡啶硫酮锌、水杨酸、二硫化硒、百里香和猫薄荷的混合油、轻啦酮(octopirox)或益生微生物，及其混合物。  Preferred examples of anti-leather shoulder agent may especially be mentioned include zinc pyrithione, salicylic acid, selenium disulfide, mixed oil of thyme and catnip, it ketone light (Octopirox) or a probiotic microorganism, and mixtures thereof . 作为抗皮肩剂的优选实例，尤其可以提及吡啶硫酮锌、水杨酸、二硫化硒及其混合物。  As preferred examples of anti-leather shoulder agent, mention may be made of zinc pyrithione, salicylic acid, selenium disulphide and mixtures thereof. 本发明组合物相对于所述组合物的总重量有利地包含0.001重量％-10重量％，优选0.1重量％ -5重量％，甚至更优选0.2重量％ -2重量％的抗皮肩剂。  The compositions of the present invention advantageously comprises relative to the total weight of the composition of 0.001 wt% to 10 wt%, preferably 0.1 wt% to 5 wt%, and even more preferably from 0.2 wt% to 2 wt% of an anti leather shoulder agents. 本发明的组件包含至少第一美容组合物和第二美容组合物，其中，所述第一组合物包含至少有效量的至少第一美容活性剂，所述第一美容活性剂为副干酪乳杆菌、其部分和/或其代谢物，所述第二组合物包含至少有效量的选自抗皮肩活性剂且为外用的至少第二美容活性剂。  assembly of the present invention comprises at least a first and a second cosmetic composition cosmetic composition, wherein the first composition comprises at least an effective amount of at least a first cosmetic active agent, the first cosmetic active agent is sub Lactobacillus casei, parts thereof and / or metabolites thereof, the second composition comprising at least an effective amount of the active agent is selected from anti-skin and is external shoulder at least a second cosmetic active agent. 根据一个实施方式，本发明的组件还可以包含至少第三组合物，所述第三组合物包含至少有效量的至少第三美容活性剂(尤其是上文定义的第三美容活性剂）。  According to one embodiment, the assembly of the present invention may further comprise at least a third composition, the third composition comprising at least an effective amount of at least a third cosmetic active agent (as defined above, especially a third cosmetic active agent ). 此第三组合物可以口服或外用。  This third composition may be administered orally or topically. 适合本发明的所述组合物可以为对于所选择的施用方式通常可获得的任何植物制剂形式。  The compositions suitable for the present invention may be in any galenic form for the selected mode of administration of the commonly available. 所述支持物(support)或载体可以具有多种性质，其取决于所述的组合物的类型。  The support (Support) or the carrier may have a variety of properties, depending on the type of composition. 更尤其地，对于用于外部局部施用的组合物，其可以为水溶液、水-醇溶液或油溶液，洗剂或精华素（serum)型的溶液或分散体，通过将脂肪相分散在水相中（0/W)或者相反将水相分散在脂肪相中（W/0)获得的液体或半液体稠度的乳液、乳型乳液，或者软的、半固体或固体稠度的混悬剂或乳液、或霜型混悬剂或乳液，水凝胶或无水凝胶，微乳液，微胶囊， 微颗粒，或离子型或非离子型囊泡分散体。  More in particular, a composition for external topical administration, which may be an aqueous solution, aqueous - alcoholic or oily solution, lotion or cream (serum) type of solution or dispersion, by dispersing a fatty phase in an aqueous phase (0 / W) or conversely the aqueous phase is dispersed in the fatty phase (W / 0) liquid or semi-liquid consistency of the obtained emulsion, a milk emulsion, or a soft, semi-solid or solid consistency of the suspension or emulsions, suspensions or emulsions, or cream type, aqueous or anhydrous gels, microemulsions, microcapsules, microparticles, or ionic or non-ionic vesicular dispersion. 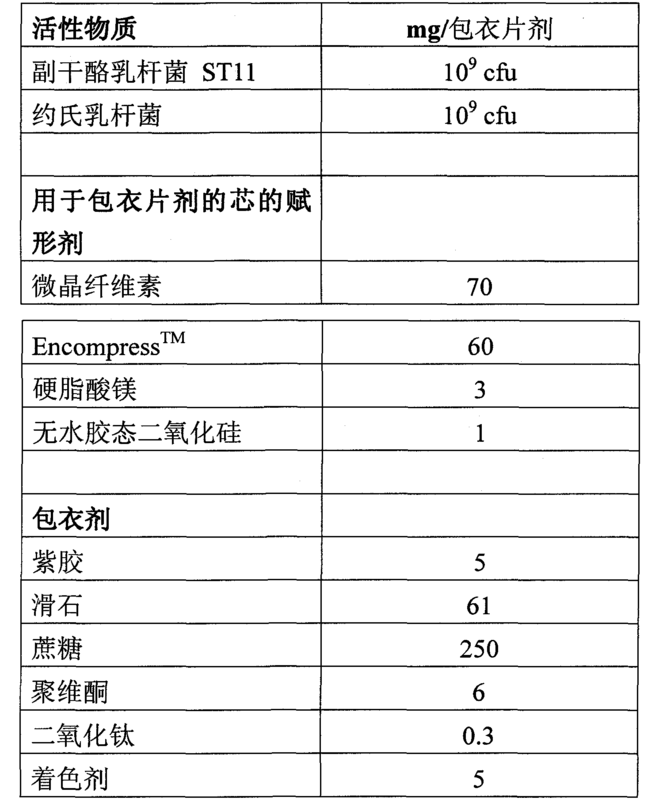 可以根据常规方法制备这些组合物。  These compositions can be prepared according to conventional methods. 这些组合物尤其可以组成清洗霜、保护霜、治疗霜或护理霜，护肤洗液，凝胶或泡沫，如洁肤洗液或消毒洗液，沐浴组合物或除臭组合物。  These compositions can in particular be composed of the cleaning creams, protective creams, treatment creams or care creams, skincare lotions, gels or foams, such as cleansing lotions or disinfecting lotions, bath compositions or deodorant compositions. 本发明的组合物还可以由构成清洗皂或清洗棒的固体制剂组成。  The compositions of the present invention may also consist of solid preparations constituting soaps or cleaning the cleaning rod. 本发明的组合物还可以以溶液、霜、凝胶、溶液或摩丝的形式，或者以还包含处于压力下的抛射剂的气雾剂的形式用于头皮。  The compositions of the present invention may also be in the form of a solution, cream, gel, mousse or solution, or in the form of further comprising a propellant in aerosol under pressure to the scalp. 本发明的外用组合物，尤其是第二组合物可以有利地被配制成适合头发护理的任何植物制剂的形式，尤其是头发洗剂、香波（尤其是抗皮肩香波）、头发调理剂（hair conditioner)、顺发剂、发乳或凝胶、造型漆（styling lacquer)、定发水（hairsetting lotion)、治疗洗剂、染料组合物(尤其是用于氧化染色）的形式，任选着色香波、头发重构洗剂(hair-restructuring lotion)、烫发组合物、用于抗脱发的洗剂或凝胶、抗寄生虫香波或加药香波的形式，尤其是抗皮脂溢香波，尤其是抗刺激、抗衰老或重构的头皮护理品或者活化血液循环的头皮护理品的形式。  Topical compositions of the present invention, especially the second composition may advantageously be formulated in any galenic form suitable for hair care, in particular hair lotions, shampoos (particularly against the shoulder skin shampoos), hair conditioning agent (hair conditioner), along initiator, a hair cream or gel, a styling lacquer (styling lacquer), set lotions (hairsetting lotion), a treating lotion, a dye composition (especially for oxidation dyeing) form, optionally coloring shampoos, hair lotions reconstruction (hair-restructuring lotion), waving composition, a lotion or gel for combating hair loss, an antiparasitic shampoo or a medicated shampoo form, particularly against sebum Yixiang waves, in particular anti-irritant, anti-aging or reconstruction of scalp care products or in the form of activating blood circulation of scalp care products. 当本发明的组合物为乳液时，脂肪相相对于该组合物总重量的比例可以为5%-80% (重量），并且优选10%_50% (重量）。  When the compositions of the present invention is an emulsion, the proportion of fatty phase relative to the total weight of the composition may be 5% -80% (by weight), and preferably 10% _50% (by weight). 在乳液形式的组合物中使用的油、乳化剂和助乳化剂选自在美容品和/或皮肤病学领域中常规使用的物质。 Oil used in an emulsion form of the composition, the substance selected from conventional emulsifiers and co-emulsifiers used in cosmetic and / or dermatological field. 所述组合物中存在的乳化剂和助乳化剂相对于该组合物的总重量的比例可以为〇.3%-30% (重量），并且优选0.5%-20% (重量）。 The present composition is co emulsifiers relative to the total weight, the composition may be 〇.3% -30% (by weight), and preferably 0.5% to 20% (by weight). 在已知的方式中，用于外用的植物制剂形式还可以包含美容、药学和/或皮肤病学领域中惯用的辅助剂，例如亲水性胶化剂或亲脂性胶化剂、亲水性活性剂或亲脂性活性剂、 防腐剂、抗氧化剂、溶剂、芳香剂、填料、掩蔽物、气味吸收剂和染料。  In a known manner, the galenic forms for external application may also comprise cosmetic, pharmaceutical and / or dermatological field customary adjuvants, gelling agent such as a hydrophilic or lipophilic gelling agents, hydrophilic or lipophilic active agents, preservatives, antioxidants, solvents, fragrances, fillers, mask, odor absorbers and dyestuffs. 所述多种辅助剂的量为相关领域的常规用量，例如为组合物总重量的0.01%_20%。 The amount is more adjuvants conventionally used in the relevant art, for example from 0.01% _20% by weight of the total composition. 根据这些辅助剂的性质，可以将其引入到脂肪相中和/或水相中。 The nature of these adjuvants may be introduced into the fatty phase and / or aqueous phase. 作为可以用于本发明的脂肪物质，可以提及矿物油，如氢化的聚异丁烯和液体凡士林，植物油，如牛油树脂、葵花油和杏仁油的液体组分，动物油，如全氢化角鲨烯、人造油， 特别是Purcel Iin油、肉豆蔻酸异丙酯和棕榈酸乙己酯，不饱和脂肪酸和氟油（f Iuoro oil)，如全氟聚醚。  As fatty substances may be used in the present invention, mention may be made of mineral oils such as hydrogenated polyisobutene and liquid petroleum jelly, vegetable oils, such as liquid component of shea butter, sunflower oil, and almond oil, animal oils, such as perhydro squalene, synthetic oils, in particular Purcel Iin oil, isopropyl myristate and palmitate, ethylhexyl acrylate, unsaturated fatty acids and fluoro oils (f Iuoro oil), such as perfluoropolyether. 也可使用脂肪醇，脂肪酸，例如硬脂酸，以及例如蜡，特别是石蜡、巴西棕榈錯和蜂錯。 It may also be used fatty alcohols, fatty acids, such as stearic acid, such as waxes and, in particular paraffin wax, carnauba and bees wrong wrong. 也可使用娃酮化合物，例如娃油，和例如环甲基娃油(cyclomethicone)和二甲基硅油，以及硅酮蜡、树脂和胶。 Baby ketone compounds may also be used, for example, baby oil, baby oil, and e.g. cyclomethicone (as cyclomethicone) and dimethicone, and silicone waxes, resins and gums. 作为可用于本发明的乳化剂，可以提及，例如硬脂酸甘油酯、聚山梨糖醇酯60，Henkel公司以商品名SinnowaxAO®出售的包含33摩尔环氧乙烧的十六烷基硬脂醇/氧乙烯化十六烷基硬脂醇的混合物，Gattefosse公司以商品名Tefose®63 出售的PEG-6/PEG-32/硬脂酸甘油酯的混合物，PPG-3十四烷基醚，硅酮乳化剂例如十六烷基二甲基硅油共聚多元醇和脱水山梨糖醇单硬脂酸酯或三硬脂酸酯，PEG-40硬脂酸酯，或氧乙烯化脱水山梨糖醇单硬脂酸(20E0)。 As the emulsifier useful in the present invention, mention may be made, for example glyceryl stearate, polyethylene sorbitan ester 60, Henkel Corporation sold under the tradename SinnowaxAO® comprises cetylstearyl burning 33 moles of ethylene oxide the mixture alcohol / oxyethylenated cetylstearyl alcohol, the company Gattefosse mixture PEG-6 / PEG-32 / Tefose®63 glyceryl stearate sold under the tradename, PPG-3 myristyl ether, silicone emulsifiers such as cetyl alcohol, dimethicone copolyol dehydrated sorbitan monostearate or tristearate, PEG-40 stearate, or oxyethylenated sorbitan monostearate alcohol fatty acid (20E0). 作为可用于本发明的溶剂，可以提及低级醇，尤其是乙醇和异丙醇，以及丙二醇。  As the solvent usable in the present invention, mention may be made of lower alcohols, especially ethanol and isopropanol, and propylene glycol. 本发明的组合物也可有利地包含泉水和/或矿泉水，尤其是选自Vittel水、来自维希盆地(Vichy basin)的水，和理肤泉(La Roche-Posay)水。  The compositions of the present invention may also advantageously comprise a spring and / or mineral water, in particular chosen from Vittel water, Vichy basin, water from (Vichy basin) of, and Posay (La Roche-Posay) water. 作为亲水凝胶剂，可以提及羧基聚合物，例如卡波姆，丙烯酸共聚物，例如丙烯酸酯/烷基丙烯酸酯共聚物、聚丙烯酰胺，尤其是SEPPIC公司以商品名Sepigel3〇5®出售的聚丙烯酰胺、C13-14异链烷烃和Laureth-7的混合物，多糖，例如衍生物，例如羟烷基纤维素， 尤其是羟丙基纤维素和羟乙基纤维素，天然胶，例如瓜耳胶、角豆荚胶和黄原酸胶，以及粘土。  As hydrophilic gelling agents, mention may be made of carboxylic polymers such as carbomer, acrylic copolymers such as acrylate / alkyl acrylate copolymers, polyacrylamides, particularly the company SEPPIC under the tradename Sepigel3〇 polyacrylamides sold 5®, C13-14 isoparaffin and Laureth-7 mixture of polysaccharides such as derivatives such as hydroxyalkyl cellulose, especially hydroxypropyl cellulose and hydroxyethyl cellulose, natural gums , such as guar gum, locust bean gum and xanthan gum, and clays. 作为亲脂凝胶剂，可以提及改性粘土，例如膨润土，脂肪酸的金属盐，例如硬脂酸铝和疏水性二氧化硅，或者乙基纤维素和聚乙烯。  As lipophilic gelling agents, there may be mentioned modified clays such as bentonite, fatty acids, metal salts such as aluminum stearate, hydrophobic silica, or ethylcellulose and polyethylene. 在本发明用于口服施用的口服应用的情况下，优选使用可吸收的支持物或载体。  In the case of oral administration of the present invention for oral application, preferably using the support or carrier absorbable. 所述可吸收的支持物或载体可以具有不同的性质，这取决于所述的组合物的类型。  The support or carrier may have different absorbable properties, depending on the type of the composition. 因此，片剂或锭剂、干式的口服补充剂和液状的口服补充剂尤其适合用作食品或药物支持物或食品载体。  Thus, tablets or lozenges, oral supplements in dry and liquid oral supplement food particularly suitable for use or pharmaceutical supports or food carriers. 所述可吸收的支持物或载体可以为，例如食品增补剂，可以通过特别用于生产可以缓释的糖衣片剂、凝胶胶囊、凝胶、乳液、片剂、胶囊和水凝胶的常规方法配制的制剂。  The support or carrier may be absorbed, for example, food supplements, can be particularly useful for the production of sustained release coated tablets, gel capsules, gels, emulsions, tablets, capsules, and hydraulic conventional methods of formulating gum formulation. 具体而言，本发明的微生物可加入到任何其他形式的食品增补剂或强化食品例如压成块的加工食品（food bar)或散粉（loose powder)或粉饼（compact powder)中。  Specifically, the microorganism of the invention may be added to any other form of fortified foods or food supplements, for example, processed foods (food bar) compressed into blocks or loose powder (loose powder) or powder (compact powder) in. 所述粉剂可在水、苏打、乳制品或大豆衍生物中稀释，或加入压成块的加工食品中。 The powders may be diluted in water, soda, dairy products or soy derivatives, or added to processed foods pressed into blocks. 此外，本发明的微生物、其部分和/或其代谢物还可以与通常用于此类口服组合物或食品增补剂的赋形剂和组分一起配制，即，具体而言，所述组分为在食品领域中常用的脂肪和/或含水组分、保湿剂、增稠剂、防腐剂、结构改进剂、风味增强剂和/或包衣剂、抗氧化剂、防腐剂和染料。  Moreover, microorganisms of the present invention, a fraction thereof and / or a metabolite thereof may also be used for the usual excipients and components of such oral compositions or food supplement formulated with, i.e., specifically, the said component commonly used in the field of food fats and / or aqueous components, humectants, thickeners, preservatives, texture improving agents, flavor enhancers and / or coating agents, antioxidants, preservatives and dyes. 用于口服组合物，并且尤其是食品增补剂中的配制剂和赋形剂在本领域中是已知的，在本文中将不对其进行详细描述。  for oral compositions, and especially in the formulation of food supplements and excipients are known in the art and not its detailed description will be used herein. 乳、酸乳酪、奶酪、发酵乳、基于乳的发酵产品、冰淇淋、基于谷类的产品或基于谷类的发酵产品、基于乳的粉、婴幼儿配方乳、糖果类食品、巧克力或谷类、动物饲料(特别是家养动物饲料）、片剂、凝胶胶囊或锭剂、液体菌悬液、干式口服补充剂和液状口服补充剂特别适合作为药物或食物支持物。  milk, yoghurt, cheese, fermented milk, milk-based fermented products, ice cream, cereal-based products or cereal-based fermented products, based on powder milk, infant formula milk, candy, food, chocolate or cereal, animal feed (in particular domestic animal feed), tablets, gel capsules or lozenges, liquid bacterial suspensions, dry oral supplements, liquid oral supplements, and are particularly suitable as pharmaceutical or food support. 根据一个实施方式，可将本发明的口服组合物，并且尤其是第一组合物配制成包衣片剂、凝胶胶囊、凝胶、乳剂、片剂、胶囊、水凝胶、块状食品或散粉或粉饼、液体混悬剂或溶液、糖果产品、发酵乳、发酵干酪、口香糖、牙膏或喷雾溶液或食品载体的形式。  According to one embodiment, the oral compositions may present invention, and in particular the first composition is formulated as coated tablets, gel capsules, gels, emulsions, tablets, capsules, hydrogels, block like food or loose powder or pressed powder, liquid suspensions or solutions, confectionery products, in the form of fermented milk, fermented cheese, chewing gum, toothpaste or spray solutions or food carrier. 除非另有说明，在以下的说明和实施例中，所述百分比是重量百分比，数值范围包括所述的上限和下限。  Unless otherwise indicated, in the following description and examples, the percentages are by weight, including ranges of values ​​of the upper and lower limits. 在配制前将组分在本领域技术人员易于确定的条件下按顺序混合。  The components are mixed in this order before formulation under conditions readily determined by one skilled in the art. 本领域技术人员可以以基本不影响本发明组合物的所需性质的方式对本发明组合物中使用的组分的含量和性质进行调整。  Those skilled in the art can adjust the content and nature of the components used in the compositions of the present invention to substantially affect the desired properties of the compositions of the present invention embodiment. 以下以本发明领域的非限制性示例的方式给出实施例。  The following examples are given by way of non-limiting example in the field of the present invention. 图1:例示了对用麦芽糖糊精(A)或IX 109cfu/g副干酪乳杆菌STll (CNCM 1-2116) ⑶治疗的个体存在的松散皮肩的临床评价。  Figure 1: illustrates the clinical evaluation of individuals with loose skin shoulder maltodextrin ⑶ treatment (A) or IX 109cfu / g Lactobacillus paracasei STll (CNCM 1-2116) occurring. 图2:例示了对用麦芽糖糊精(A)或IX 109cfu/g副干酪乳杆菌STll (CNCM 1-2116) ⑶治疗的个体存在的粘附皮肩的临床评价。  Figure 2: illustrates the clinical evaluation of skin adhesion of the individual shoulder maltodextrin ⑶ treated with (A) or IX 109cfu / g Lactobacillus paracasei STll (CNCM 1-2116) present. 图3:例示了对用麦芽糖糊精(A)或IX 109cfu/g副干酪乳杆菌STll (CNCM 1-2116) ⑶治疗的个体的红斑的临床评价。  FIG 3: illustrates the clinical evaluation of erythema in individuals treated with Maltodextrin ⑶ (A) or IX 109cfu / g Lactobacillus paracasei STll (CNCM 1-2116) of. 每日可服用一个棒。  a day can take a stick. 此类型糖衣片剂可每天服用1-3次。  This type of sugar-coated tablets may be administered 1-3 times per day. 治疗包括持续8周(56天)每日口服给予单剂量治疗。  Treatment includes 8 weeks (56 days) daily oral administration of a single dose treatment. 对年龄在18-60岁之间的66名成年男性个体进行该研究，且这些男性是在临床评估(分类为中度至严重)其皮肩问题后得到证实的，他们的评分大于或等于3 (评分分级为0-4)，在头部的至少两个区域存在粘附鳞肩。  of age and at 66 adult male subjects between 18-60 years of the study, and these men are in clinical evaluation (classified as moderate to severe) after its leather shoulder problem to be identified, and their score greater than or equal to 3 (score 0-4 rating), the presence of adherent scales on at least two shoulder region of the head. 在临床评价中，头皮存在的红斑和脂溢性皮炎也考虑在内。  In the clinical evaluation, the presence of erythema and of seborrhoeic dermatitis of the scalp are also contemplated. 这66名个体被分成2个平行组，每组33人，其中一组接受测试产品，而另一组接受安慰剂。  This 66 individuals were divided into two parallel groups of 33, one group receiving the test product and the other receives a placebo. 利用根据以下参数进行的临床评价和自评价，与安慰剂制剂相比较来评价所测试的增补剂在第1、15、29、43、57和64天(治疗后有1周的中断）的效果:松散皮肩、粘附鳞肩、红斑和皮脂溢、面部皮脂溢和瘙痒。  With the self-evaluation and clinical evaluation of the following parameters, the test was evaluated in comparison with the placebo formulation supplements on day 1,15,29,43,57 and 64, a 1-week interruption (after treatment ) effect: loose skin shoulder, shoulder adherent scales, erythema and seborrhoea, facial seborrhoea and itching. 所评价的临床参数为存在的松散和粘附皮肩，存在的鳞肩、红斑、面部皮脂溢和头皮皮脂溢，并且还测定了存在的马拉色菌酵母。  The clinical parameters evaluated are the presence of loose and adherent skin shoulder, the shoulder existing scales, erythema, facial seborrhoea and seborrhoea of ​​the scalp, and also measurement of the presence of Malassezia yeast. 根据本领域实施的常规技术进行这些评价。  These evaluated in accordance with conventional techniques embodiment of the present art. 进行治疗的个体的自评价参数为存在的皮肩、瘙痒、油性状况的感觉、刺激、发红、 紧绷感和头皮的感觉，还有面部皮脂溢和头皮的皮脂溢。  Since the individual evaluation parameters for the treatment of leather shoulder exists, itching, feeling oily conditions, irritation, redness, feeling of tightness and scalp, as well as seborrhea seborrhea facial and scalp. 所获得的结果表明，与接受安慰剂的个体相比，利用组合物B治疗的个体的头皮的皮肩问题、红斑和脂溢性皮炎自开始治疗的第1周就有明显改善。 Results  The obtained show that, compared to individuals receiving placebo, a shoulder skin problems treatment using the compositions B individual scalp seborrheic dermatitis erythema and since the first week of therapy have significantly improved. 过计数头皮上的马拉色菌属酵母的数量进行这些评价。  The number of the yeast Malassezia on the scalp count these evaluations. 由图1例示的结果表明，与安慰剂相比，松散皮肩减少，在第15天具有减少的趋势(p = 0.057)，在第29天减少显著且直至第57天(p<0.0001)。  indicated by the results shown in FIG Example 1, compared with placebo, loose skin shoulder reduced, having a reduced tendency (p = 0.057) on day 15, significant reduction at day 29 and up to 57 days (p < 0.0001). 活性剂产生的在第1天和第57天之间的变化明显(p = 0.0005)。  The active agent change generated between the first and D57 is significant (p = 0.0005). 疗中断后1周后在第64天，与安慰剂相比，在第1天和第64天之间，治疗仍保持效果(p = 0.0489)。 After 1 week off treatment after day 64, compared with placebo, between day 1 and day 64, the treatment effect remains (p = 0.0489). 活性剂产生的在第1天和第57天之间的变化明显(p = 0.0005)。  The active agent change generated between the first and D57 is significant (p = 0.0005). 活性剂产生的在第1天和第57天之间的变化明显(p = 0.00469)。  The active agent change generated between the first and D57 is significant (p = 0.00469). 从该临床方面来看，观察到本发明组合物的效果在第57天和第64天之间仍然完全维持。 From the clinical point of view, the observed effect of the composition according to the present invention remains fully maintained between 57 days and 64 days. 所得自评价结果显示，与临床评价所述的各种参数观察到的特征的类型相同。  The results obtained from the evaluation showed that the various parameters of the same type observed characteristics and the clinical evaluation. 具体而言，观察到活性剂对瘙痒的作用，与安慰剂相比，该作用在第1天和第57天之间是显著的(P = 0.0427)。  Specifically, the observed effect of the active agent for pruritus, compared with placebo, which acts between the first and D57 is significant (P = 0.0427). 同样，志愿者还评价了其头皮油性问题，与安慰剂相比，头皮油性问题在第1天和第57天之间降低非常明显和显著。  Similarly, the volunteers was also evaluated its oily scalp problems, compared with placebo, oily scalp problems between the first and D57 is very clear and significant decrease. 对于面部皮脂溢，与安慰剂相比，利用益生元在第57天观察到皮脂溢减少的趋势(P = 〇. 1735)。 For the facial seborrhoea, compared with placebo, prebiotic use in day 57 was observed seborrhea decreasing trend (P = square. 1735). 所述活性剂引起的第1天和第57天之间的变化显著(ρ = 0.0272)，而安慰剂组在第1天和第57天之间没有变化。  The change between day 1 and day 57 due to a significant active agent (ρ = 0.0272), while the placebo group did not change between the first and D57. 治疗1周后在第64天，所述产品的效果仍然维持(与安慰剂组相比，趋势有效，P = 0.2312)。  After 1 week of treatment at day 64, the effect of the product remains (compared to placebo, effectively trend, P = 0.2312). 以下实施例为用于本发明方法和组件的组合物的实施例。 To compositions and methods for the assembly of an embodiment of the present invention  The following Examples. 此类型包衣片剂可每天服用1-3次。  This type of coated tablet may be administered 1-3 times per day. B:含1%吡啶硫酮锌的香波。  B: shampoo containing 1% zinc pyrithione. 所述治疗由以下组成：通过口服途径每天施用单独剂量的组合物并通过外用途径每天施用组合物⑶，持续4周，然后再单独施用组合物㈧4周。  The treatment consists of: a single administration by the oral route daily dose of the composition is administered by topical route composition ⑶ daily for four weeks, then administering the separate compositions ㈧4 weeks. 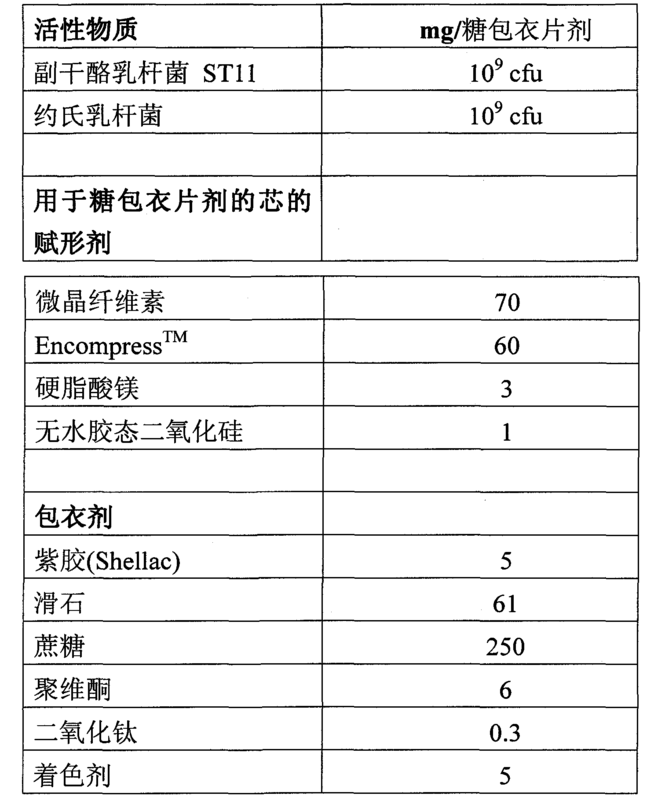 为了比较，单独口服施用组合物㈧或单独外用组合物⑶，共8周。 For comparison, a single oral administration of a composition (viii) or a separate external composition ⑶, 8 weeks. 对年龄在18-60岁之间的99名成年男性进行该研究，且这些男性是在临床评估(分类为中度至严重)其皮肩问题后得到证实的，他们的评分大于或等于3 (评分分级为0-4)，头部的至少两个区域存在鳞肩和头皮红斑。  of age and at 99 adult males between 18-60 years of the study, and these men are in clinical evaluation (classified as moderate to severe) after its leather shoulder problem to be identified, and their score greater than or is equal to 3 (score 0-4 rating), presence of erythema scales shoulders and scalp at least two regions of the head. 在临床评价中，存在的红斑也考虑在内。  In the clinical evaluation, the presence of erythema also taken into account. 这99名个体被分成3个平行组，每组33人，其中一组接受组合物(A)和⑶且然后仅接受组合物(A)，一组仅接受组合物(A)，一组仅接受组合物⑶。  This subject 99 is divided into three parallel groups of 33, one group receiving composition (A) and ⑶ and then only receiving the composition (A), one group received the composition (A), one group received the composition ⑶. 利用对以下参数进行临床评价的方式，测试本发明组件和组合物的效果，并通过在第1、15、29、43和57天对三组进行比较来评价:游离的皮肩、粘附鳞肩和红斑，并计算整体打分。  evaluated using the following clinical parameters manner, assembly and test results of the compositions of the present invention, and by comparing the three groups at days 1,15,29,43 and 57 were evaluated: free transdermal shoulder, adhesion shoulder and erythema scales, the overall score was calculated. 这些评价由有资格的皮肤科医生通过本领域常用的技术进行。  The evaluation was conducted by a qualified dermatologist by conventional techniques in the art. 通过相加游离皮肩、粘附鳞肩和红斑的分值计算临床整体打分。  By adding free skin shoulder, the shoulder and erythema scales adhesion score calculation overall clinical score. 所述分值可以为0-48之间。  The value may be between 0-48. 因此，分值在9-13之间在临床上是有利的，原因是9分相当于通常在无皮肩个体中的分值(各项分值均为3)。 Thus, the value between 9-13 is clinically advantageous because nine points corresponding to the score generally skinless shoulder individuals (both the score 3). 对游离皮肩和粘附皮肩以及对红斑的打分的结果（用临床总分(TCS))表明，相对于仅接受组合物㈧或⑶的个体，根据本发明方法用㈧+⑶的组合治疗的个体中头皮的皮肩问题和红斑自治疗第1周开始有显著改善。  The results of the free skin erythema scoring shoulder and the shoulder skin and the adhesive (a clinical score (the TCS)) shows that, only with respect to the individual receiving the composition ⑶ or (viii), (viii) a method according to the present invention ⑶ + leather shoulder problem scalp of a subject combination therapy 1 week and erythema from start of treatment showed significant improvement. 具体而言，所述抗皮肩治疗的功效在治疗的头几天就显现出来，并且持续在所述治疗中且强度增加，从而获得显著改善的临床打分。  Specifically, the anti-shoulder skin treatment efficacy of treatment in the first few days will show up, and increase the strength and duration of the treatment, to obtain a significant improvement in clinical score. 另一方面，临床效果反映单独施用所述益生元到治疗的最后几周基本明显，而单独施用抗皮肩活性剂显示的作用在治疗初期可见，但迅速消失。  On the other hand, reflect the clinical effect of the prebiotic separately administered to substantially clear the final weeks of treatment, and the effect of anti administered alone shoulder transdermal active agent visible on the display of initial treatment, but quickly disappeared. 1. 有效量的至少一种副干酪乳杆菌益生微生物、其片段和/或其代谢物在制备用于预防和/或治疗头皮皮肩病症的口服组合物中的应用。 1. an effective amount of at least one of Lactobacillus paracasei probiotic microorganism, fragments and / or its metabolites in the preparation of for preventing and / or treating oral compositions Phi head shoulder disorder. 2. 如权利要求1所述的应用，其中，所述预防和/或治疗头皮皮肩病症是预防和/或治疗头皮的皮肩问题。 2. The use according to claim 1, wherein the prevention and / or treatment of a disorder is head and shoulders Phi / or prevention of scalp skin of the shoulder. 3. 如权利要求1所述的应用，其中，所述预防和/或治疗头皮皮肩病症是提高头皮舒适度。 , Wherein the prevention and / or treatment of head and shoulder condition is improved Phi Pishu appropriate application head according to claim 1. 4. 如权利要求1所述的应用，其中，所述预防和/或治疗头皮皮肩病症是重建头皮的生态菌群平衡。 4. Use according to claim 1, wherein the prevention and / or treatment of disorders head shoulder reconstruction Phi balanced ecoflora of the scalp. 5. 如权利要求1所述的应用，其中，所述预防和/或治疗头皮皮肩病症是保持和/或增强头皮的皮肤屏障功能的完整性。 5. Use according to claim 1, wherein the prevention and / or treatment head to maintain the integrity Phi shoulder condition and / or enhance the barrier function of the skin of the scalp. 6. 如权利要求1所述的应用，其中，所述微生物为副干酪乳杆菌CNCM 1-2116。 6. Use according to claim 1, wherein said microorganism is Lactobacillus paracasei CNCM 1-2116. 7. 如权利要求1所述的应用，其中，所述微生物以相对于包含该微生物的组合物的总重量计为0.0001重量％至20重量％的比例使用。 7. Use according to claim 1, wherein said microorganism ratio relative to the total weight of the composition comprising the microorganism of 0.0001 wt% to 20 wt% is used. 8. 如权利要求1所述的应用，其中，所述微生物为副干酪乳杆菌作为第一微生物与至少有效量的不同于所述第一微生物的至少第二微生物组合。 8. The use according to claim 1, wherein said microorganism is Lactobacillus paracasei as at least the second microorganism in combination with at least an effective amount of a microorganism different from the first first microorganism. 9. 如权利要求8所述的应用，其中，所述第二微生物选自子囊菌纲(ascomycetes)，所述子囊菌纲第二微生物选自酵母属(Saccharomyces)，耶罗威亚酵母属(Yarrowia)，克鲁维酵母属（Kluyveromyces)，孢圆酵母属（Torulaspora)，粟酒裂殖酵母属(Schizosaccharomyces pombe)，德巴利酵母属(Debaromyces)，假丝酵母属（Candida)，毕赤酵母属(Pichia)，曲霉属(Aspergillus)和青霉属(Penicillium)，双歧杆菌属、拟杆菌属(Bacteroides)、梭杆菌属(Fusobacterium)、蜜蜂球菌属(Melissococcus)、丙酸杆菌属(Propionibacterium)、肠球菌属(Enterococcus)、乳球菌属(Lactococcus)、葡萄球菌属(Staphylococcus)、消化链球菌属（Peptostrepococcus)、杆菌属（Bacillus)、片球菌属(Pediococcus)、微球菌属（Mirococcus)、明串珠菌属（Leuconostoc)、魏斯氏菌属(Weissella)、气球菌属(Aerococcus)、酒球菌属(Oenococcus)或乳杆菌属的细菌，及其混合物。 9. The use of the yeast of the genus Yarrowia 8 (claim, wherein the second microorganism is selected from Ascomycetes (ascomycetes), the second microorganism is selected from Ascomycetes Saccharomyces (Saccharomyces), Yarrowia), Kluyveromyces (Kluyveromyces), spore round Saccharomyces (Torulaspora), S. pombe genus (Schizosaccharomyces pombe), Debaryomyces (Debaromyces), Candida (Candida), Pichia Saccharomyces (Pichia), Aspergillus (Aspergillus) and Penicillium (Penicillium), Bifidobacterium, Bacteroides (Bacteroides), Fusobacterium (Fusobacterium), bees Lactococcus (Melissococcus), Propionibacterium ( Propionibacterium), Enterococcus (Enterococcus), Lactococcus (Lactococcus), Staphylococcus (Staphylococcus), Streptococcus digest (Peptostrepococcus), genus (Bacillus), Pediococcus (Pediococcus), Micrococcus (Mirococcus ), Leuconostoc (Leuconostoc), Weissella (Weissella), Aerococcus (Aerococcus), Oenococcus (from Oenococcus) or bacteria of the genus Lactobacillus, and mixtures thereof. 10. 有效量的至少一种副干酪乳杆菌益生微生物，和/或其片段和/或其代谢物在制备用于预防和/或治疗头皮炎症的口服药用或皮肤病用组合物中的应用。 10. The effective amount of at least one of Lactobacillus paracasei probiotic microorganism, and / or fragments thereof and / or metabolites thereof in the application of the composition for the prevention and / or treatment of inflammation of the scalp oral pharmaceutical or dermatological . 11. 如权利要求10所述的应用，其中，所述预防和/或治疗头皮炎症是预防和/或治疗头皮的瘙痒和/或脂溢性皮炎。 11. The use according to claim 10, wherein the prevention and / or treatment of inflammation of the scalp is the prevention and / or treatment of itching of the scalp and / or seborrheic dermatitis. 12. 用于预防和/或治疗头皮病症的美容用和/或皮肤病用口服组合物，其包含于生理学上可接受的介质中的至少有效量的至少一种副干酪乳杆菌益生微生物，和/或其片段和/ 或其代谢物，以及有效量的选自抗皮肩活性剂和水合活性剂及其混合物的至少一种活性剂。 12. A method for preventing and / or treating scalp disorders cosmetic and / or dermatological composition for oral administration, comprising in a physiologically acceptable medium, at least an effective amount of at least one of Lactobacillus paracasei probiotic microorganism, and / or fragments thereof and / or metabolites thereof, an effective amount of an active agent selected from anti shoulder and hydrated skin active agent and mixtures of at least one active agent. 13. 有效量的至少一种副干酪乳杆菌益生微生物，和/或其片段和/或其代谢物在制备用于治疗和/或预防个体头皮美学障碍的口服组合物中的应用。 Probiotic microorganism, and / or fragments thereof and / or metabolites thereof in the manufacture for the treatment and / or oral composition for preventing aesthetic disorders of the scalp of the subject in an effective amount of at least one 13 paracasei. 14. 有效量的至少第一口服美容活性剂和至少第二美容活性剂在制备用于预防和/或处理头皮的皮肩问题的组合物中的应用，其中，所述第一口服美容活性剂和第二美容活性剂被配制成单独的组合物，所述第一口服美容活性剂选自副干酪乳杆菌、其片段和/或其代谢物，所述第二美容活性剂选自抗皮肩活性剂，所述第一口服美容活性剂在第一和第二连续时间施用，所述时间共同形成次序，所述第二美容活性剂在选自第一时间和第二时间的单个时间内外用。 14. The orally effective amount of at least a first cosmetic active agent and at least a second cosmetic active agent applications in the prevention and / or treatment of the scalp skin shoulder compositions for preparing, wherein said first cosmetic active agent orally and a second cosmetic active agent is formulated as separate compositions, the first cosmetic active agent is selected from oral Lactobacillus paracasei, fragments and / or metabolites thereof, the second cosmetic active agent is selected from anti leather shoulder active agent, said first oral cosmetic active agent in the first and second continuous time of administration, the time sequence together form a second cosmetic active agent is selected from a single time in and out of the first and second times by . 15. 如权利要求14所述的应用，其中，在所述第一时间施用所述第二美容活性剂。 15. The use according to claim 14, wherein, in a first time the administration of the second cosmetic active agent. 16. 如权利要求14所述的应用，其中，所述次序重复至少一次。 16. The use according to claim 14, wherein the sequence repeated at least once. 17. 如权利要求14所述的应用，其中，所述第一时间和第二时间彼此独立地为1-6周。 17. The use according to claim 14, wherein said first and second times independently of one another 1-6 weeks. 18. 如权利要求14所述的应用，其中，头皮的皮肩问题兼有头皮干燥、头皮高皮脂溢、头皮生态菌群失衡、瘙痒、炎症或者头皮屏障功能失衡。 18. The use according to claim 14, wherein the shoulder of the scalp skin both dry scalp, scalp seborrhea high, imbalance in the scalp ecoflora, pruritus, inflammation or imbalance in the barrier function of the scalp. 19. 如权利要求14所述的应用，其中，所述第一口服美容活性剂为副干酪乳杆菌CNCM 1-2116。 19. The use according to claim 14, wherein said first cosmetic active agent is orally Lactobacillus paracasei CNCM 1-2116. 20. 如权利要求14所述的应用，其中，所述第一口服美容活性剂以相对于包含该美容活性剂的组合物的总重量计为0. 〇〇〇1重量％至20重量％的比例使用。 20. 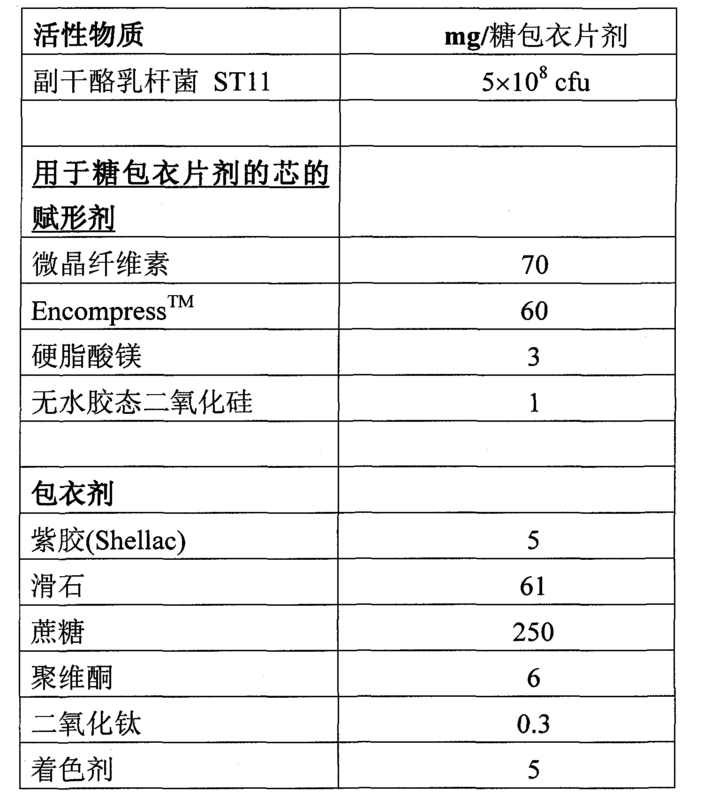 The use according to claim 14, wherein said first cosmetic active agent orally to total weight of the cosmetic composition comprising the active agent in terms 〇〇〇1 0.5% to 20% by weight of proportion. 的三卤代脲，三氯沙，唑类化合物，抗真菌聚合物，硫化硒，硫化镉，尿囊素，煤焦油或木焦油或杜松油，水杨酸，十一碳烯酸，富马酸，丙烯胺，环吡酮、羟吡酮，吡罗克酮乙醇胺，丙酸氯倍他索， 倍他米松戊酸酯，茶树油，百里香和猫薄荷的混合油和益生微生物，及其混合物。 Trihalo urea, triclosan, azole compounds, antifungal polymers, selenium sulfide, cadmium sulfide, allantoin, coal tar or wood tar or cade oil, salicylic acid, undecylenic acid, Rich Ma acid, acrylamide, ciclopirox, olamine hydroxyalkyl, piroctone olamine, clobetasol propionate, betamethasone valerate mixed oil, tea tree oil, thyme and catnip, and a probiotic microorganism, and mixture. 22. 如权利要求14所述的应用，其中，所述第二美容活性剂选自吡啶硫酮锌、水杨酸、二硫化硒、百里香和猫薄荷的混合油、羟吡酮和益生微生物，及其混合物。 22. Use according to claim 14, wherein said second cosmetic active agent chosen from zinc pyrithione, salicylic acid, selenium disulfide, mixed oil of thyme and catnip, and hydroxyethyl pyrrolidone probiotic microorganism, and mixtures thereof. 23. 如权利要求14所述的应用，其中，所述第二美容活性剂以相对于所述组合物的总重量计为0.001重量％至10重量％的比例使用。 23. Use according to claim 14, wherein said second cosmetic active agent relative to the total weight of the composition ratio of 10 wt% to 0.001% by weight to use. 24. 如权利要求14所述的应用，包括第三美容活性剂在制备用于预防和/或处理头皮的皮肩问题的组合物中的应用，所述第三美容活性剂选自染发剂、防止脱发和/或促进生发的活性剂、顺发剂、头发定型剂、用于预防和/或治疗秃头的活性剂、抗皮脂溢剂、抗生素、激素、抗雄激素物质、其它益生微生物、水合剂、抗氧化剂和维生素及其混合物。 24. Use according to claim 14, comprising a third cosmetic active agent in the prevention and / or treatment of the scalp skin shoulder composition for the preparation of the third cosmetic active agent selected from hair dye, prevent hair loss and / or promoting hair growth agents, smooth hair, hair styling agents, for the prevention and / active agent or treating baldness, an anti-seborrhoea agents, antibiotics, hormones, anti-androgens, other probiotic microorganisms, water agents, antioxidants and vitamins, and mixtures thereof. 25. 如权利要求24所述的应用，其中，所述第三美容活性剂与第一口服美容活性剂和/ 或第二美容活性剂一起配制和/或分别配制在单独的组合物中。 25. The use according to claim 24, wherein said third cosmetic active agent is formulated with an oral first cosmetic active agent and / or a second cosmetic active agent together and / or separately formulated in separate compositions. 26. 美容组件，其包含至少第一口服美容组合物和第二美容组合物，其中，所述第一口服美容组合物包含至少有效量的至少第一美容活性剂，所述第一美容活性剂为副干酪乳杆菌、其片段和/或其代谢物，所述第二美容组合物包含至少有效量的选自抗皮肩活性剂且为外用的至少第二美容活性剂。 26. Cosmetic assembly comprising at least a first and a second cosmetic composition for oral cosmetic composition, wherein the first oral cosmetic composition comprising at least an effective amount of at least a first cosmetic active agent, the first cosmetic active agent is Lactobacillus paracasei, fragments and / or metabolites thereof, said second cosmetic composition comprising at least an effective amount of an active agent selected from anti-skin and is external shoulder at least a second cosmetic active agent. 27. 如权利要求26所述的组件，其中，所述第二美容活性剂如权利要求21-23中任一项所定义。 27. The assembly according to claim 26, wherein said second cosmetic active agent as claimed in any one of claims 21-23 defined. 28. 如权利要求26所述的组件，其中，所述第二美容组合物为头发洗剂，凝胶，或头皮护理品。 28. The assembly according to claim 26, wherein said second cosmetic composition is a hair lotion, gel, or scalp care. 29. 如权利要求28所述的组件，其中，所述第二美容组合物为香波，头发调理剂，顺发剂，发乳，造型漆，定发水，治疗洗剂，头发重构洗剂，烫发组合物。 29. The assembly according to claim 28, wherein said second cosmetic composition is a shampoo, hair conditioner, hair cis agent, hair cream, styling lacquer, set lotions, treatment lotions, hair lotions reconstruction, waving compositions. 30. 如权利要求29所述的组件，其中，所述第二美容组合物为抗寄生虫香波或加药香波。 30. The assembly according to claim 29, wherein said second cosmetic composition for the antiparasitic shampoo or medicated shampoos. 31. 如权利要求30所述的组件，其中，所述第二美容组合物为抗皮脂溢香波。 31. The assembly according to claim 30, wherein said second cosmetic composition is an anti-sebum Yixiang wave. 32. 如权利要求26所述的组件，其还包含至少第三组合物，其中所述第三组合物包含至少有效量的至少第三美容活性剂。 32. The assembly according to claim 26, further comprising at least a third composition, wherein the third composition comprising at least an effective amount of at least a third cosmetic active agent. 33. 如权利要求32所述的组件，其中第三美容活性剂是权利要求24中定义的第三美容活性剂。 33. The assembly according to claim 32, wherein the third cosmetic active agent is a cosmetically active agent third defined in claim 24. 34. 如权利要求29所述的组件，其中，所述第二美容组合物为任选着色香波形式的染料组合物。 34. The assembly of claim 29 wherein said second cosmetic composition is a shampoo, optionally colored form of the dye composition of Claim 1. 35. 如权利要求29所述的组件，其中，所述第二美容组合物为用于抗脱发的洗剂或凝胶。 35. The assembly according to claim 29, wherein said second cosmetic composition for combating hair loss lotion or gel. 36. 至少有效量的至少第一口服美容活性剂和第二美容活性剂在制备用于预防和/或治疗头皮的皮肩问题的权利要求26至35任一项所述的美容组件中的应用，其中，所述第一口服美容活性剂为副干酪乳杆菌、其片段和/或其代谢物，所述第二美容活性剂选自抗皮肩活性剂且为外用的抗皮肩活性剂。 36. at least an effective amount of at least a first and a second cosmetic active agent for oral cosmetic active agent in an application according to any one of claims 26 to 35 for preparing a cosmetic component and / or prophylactic treatment of scalp skin claimed shoulder problems requires wherein said first cosmetic active agent is orally paracasei, fragments and / or metabolites thereof, the second cosmetic active agent selected from anti-skin agent and the shoulder is a topical anti-skin agent shoulder. MX2007004135A (en) * 2004-10-04 2007-06-15 Oreal Cosmetic and/or dermatological composition for sensitive skins. FR2920304B1 (en) * 2007-09-04 2010-06-25 Oreal lysate cosmetic use of Bifidobacterium species for the treatment of dryness. FR2920305B1 (en) * 2007-09-04 2010-07-30 Oreal The use of a lysate of Bifidobacterium species for the treatment of sensitive skins. FR2956812B1 (en) * 2010-03-01 2013-03-08 Oreal Cosmetic composition ellagic acid base or a derivative thereof and an extract of bacteria. FR2988607B1 (en) * 2012-03-27 2016-07-15 Oreal Using a culture lysate of a bacterium of the genus Vitreoscilla sp. to prevent and / or treat hyperseborrheic states of the scalp. FR2711060B1 (en) 1993-10-13 1995-11-17 Oreal A method for modifying hair growth and / or hair and compositions used for this purpose. ES2307531T3 (en) 1999-09-07 2008-12-01 Societe Des Produits Nestle S.A. Method to improve skin and fur of pets. ES2357419T3 (en) 2011-04-26 Use of probiotic bacteria producing lactic to protect the skin against inflammatory, allergic or immunosuppressant caused by ultraviolet radiation reactions acid.